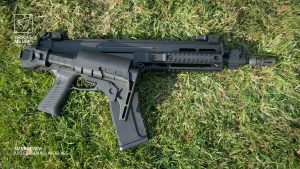 In a world ruled by the AR15 and every variant of the Kalashnikov known to man, it is a nice sight for soar eyes to see something different. 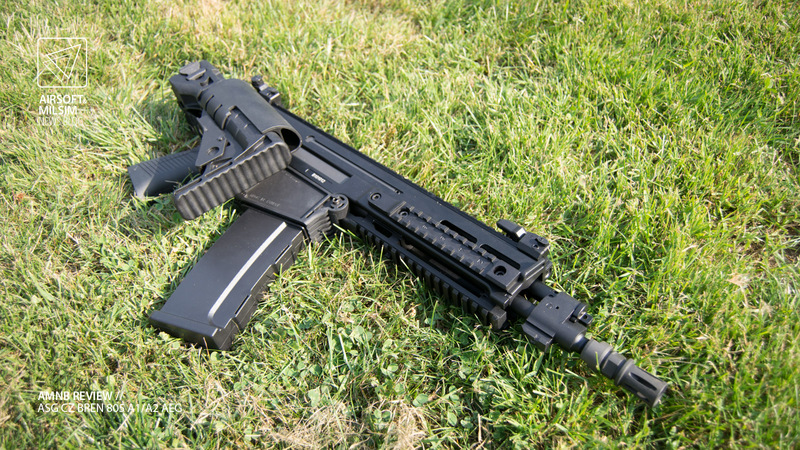 The CZ 805 Bren was designed to replace the Sa vz. 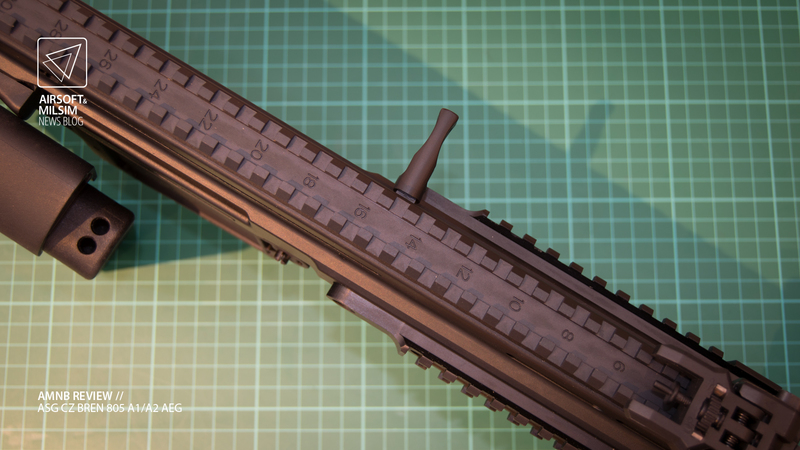 58 (no that isn’t a typo). 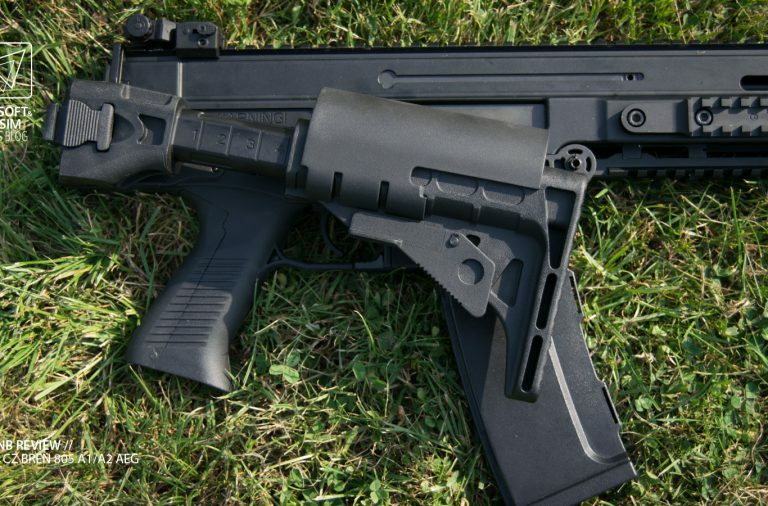 The Sa vz. 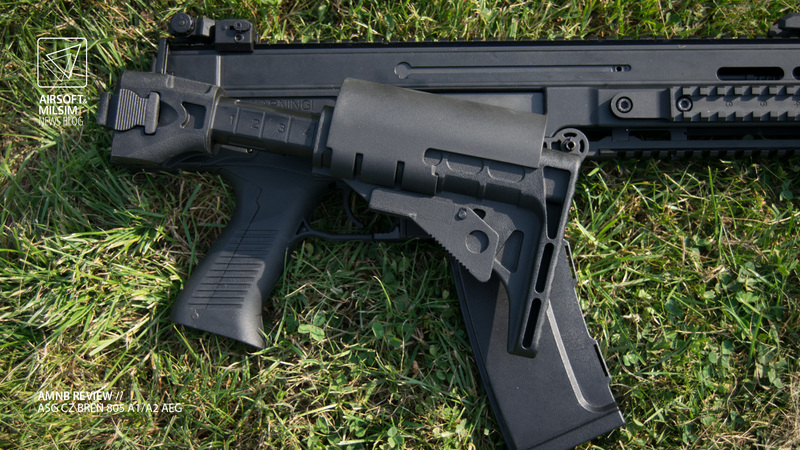 58 was developed in the 1950s as an alternative to the AKM. 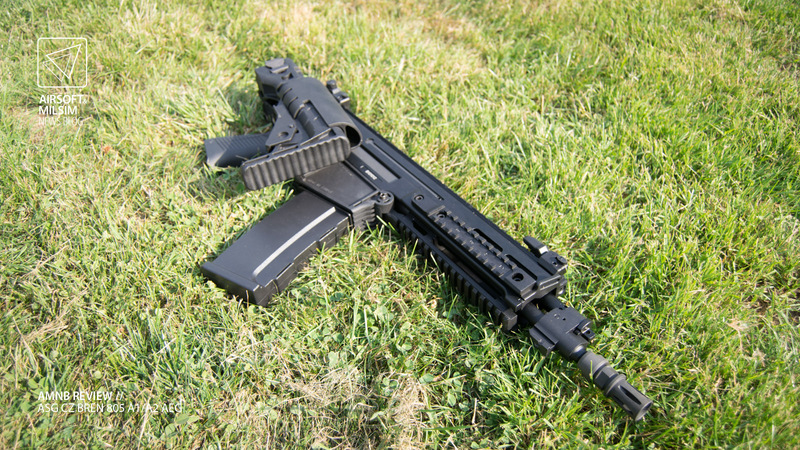 Being the only Warsaw Pact member to not use a variation of the Kalashnikov, Czechoslovakia adopted the vz. 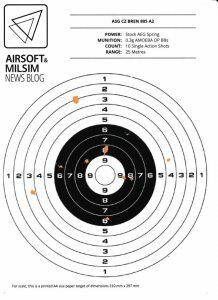 58 in the same calibre but ended up changing it to a 5.45 round to accommodate different roles. 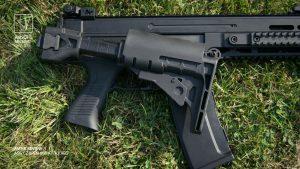 By the time the country split into two, the Lada S. was being designed with a rocky start to prototyping and eventual cancellation. 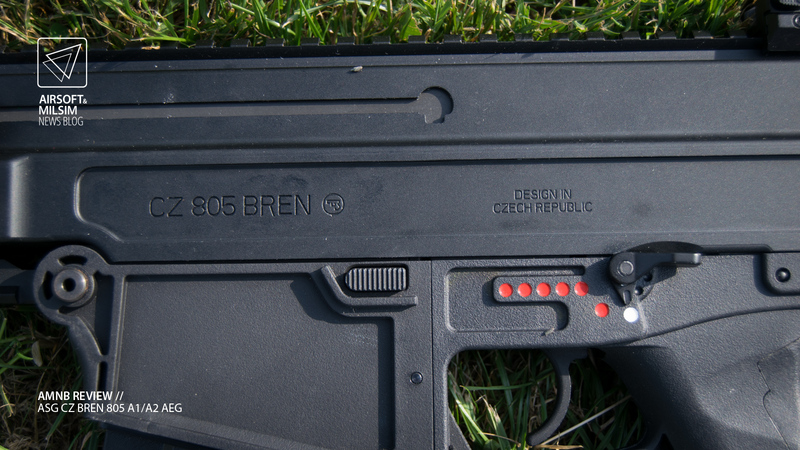 Finally being offered for export as the CZ 2000, the rifle didn’t last very long and required a major redesign. 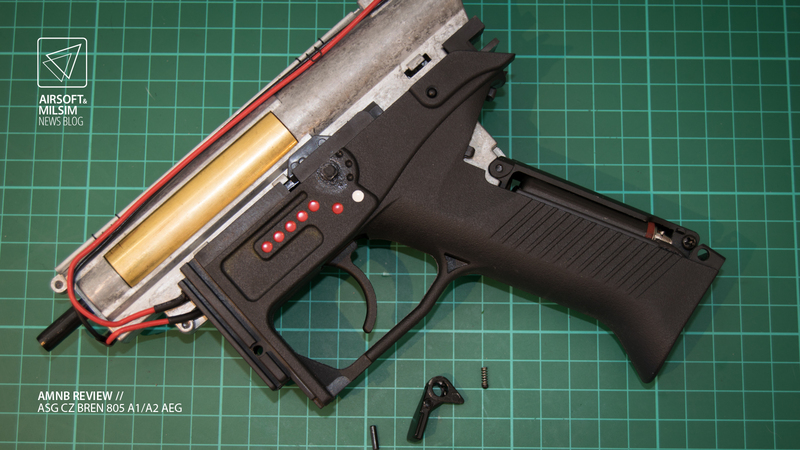 There was definitely time for a new project by this time. 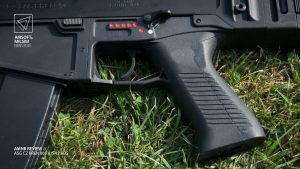 2005 came along and so did Project 805. 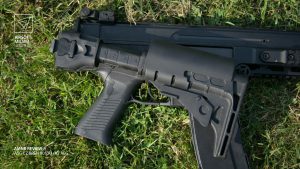 The new firearm would at first chamber both Soviet and NATO rounds but eventually ended only being designed in the 5.56 NATO calibres. 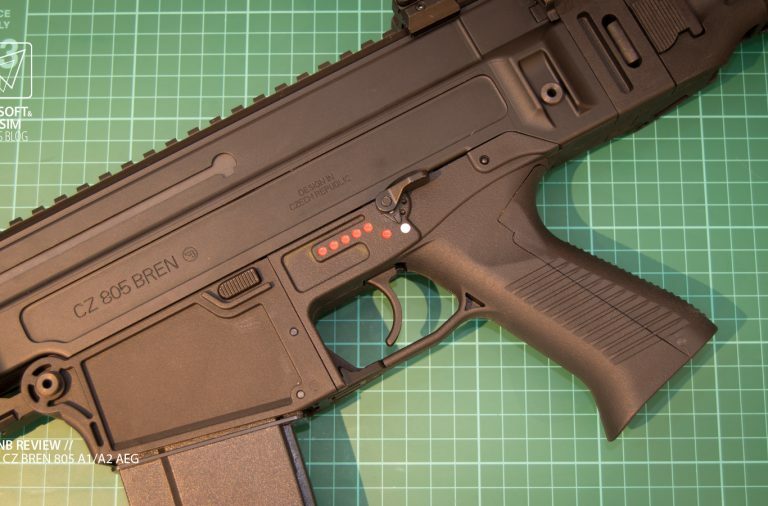 After many trials and a narrow victory against 27 other weapon systems, the CZ 805 Bren was publicly declared the replacement for the Czech military in February 2010. 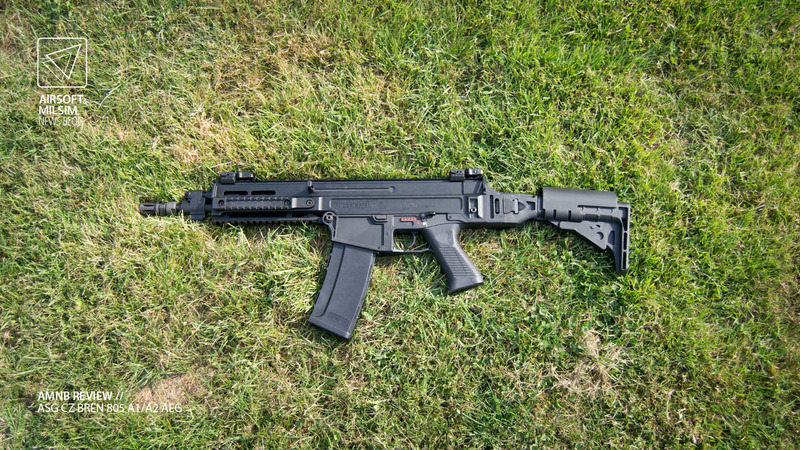 ASG have previously released the CZ Scorpion EVO A3 with much success followed by not only the CZ P09 but the CZ SP01 Shadow as well. 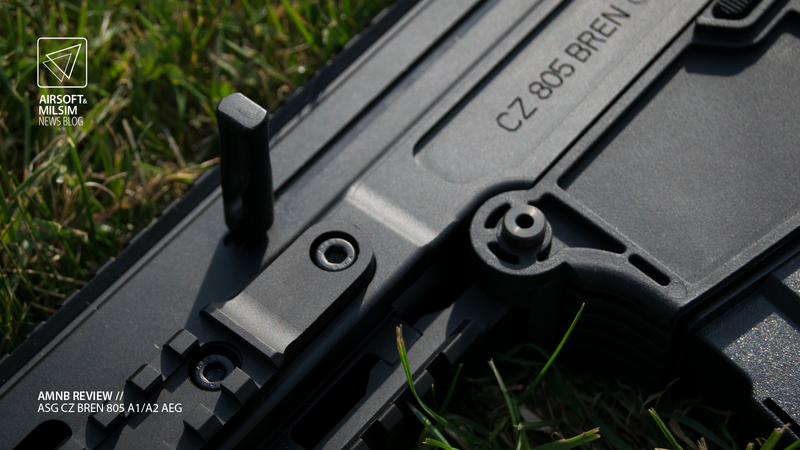 Now comes the CZ Bren 805 A1/A2 in both short and long variants. 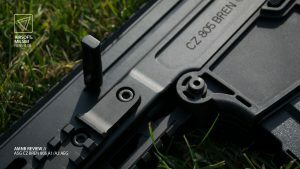 It is a pity that the CZ Bren 805 did not get the same PTW-esque treatment as the EVO A3, however it did seem to get the same external treatment in regards to how closely it resembles the real counterpart. 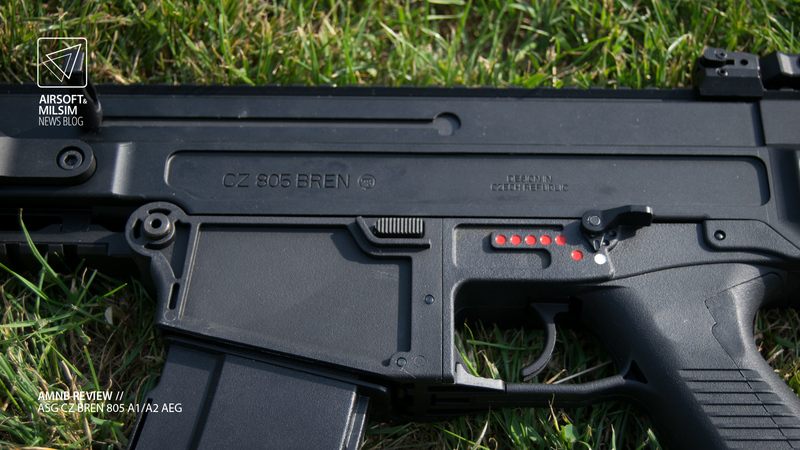 The ASG CZ Bren 805 is a standard automatic electric gun with a few features which are slowly becoming a standard for all manufacturers. 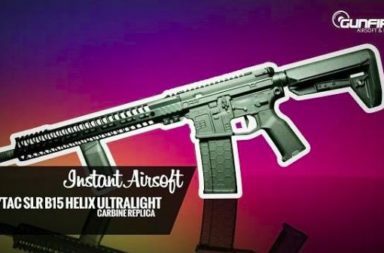 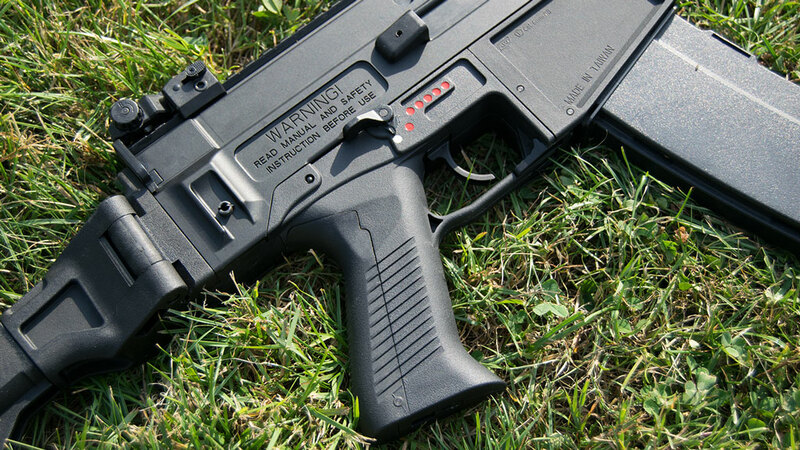 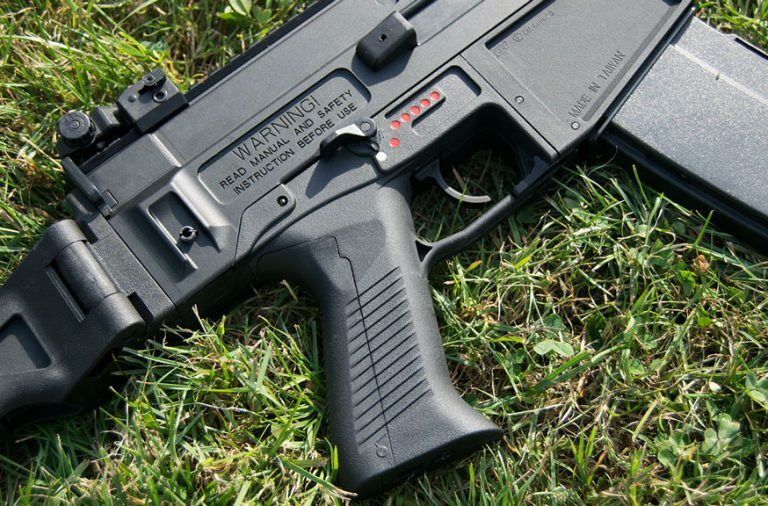 The externals however are very unique to the real counterpart and hence provide even more of a flare than just any standard AEG on the market. 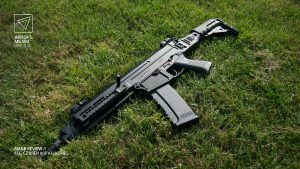 The ASG CZ 805 Bren much like its real counterpart has a metal upper receiver and a polymer lower receiver (relative to FN’s SCAR project). 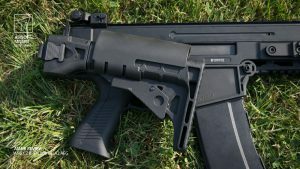 A mostly left hand friendly rifle, the Bren comes with an ambidextrous fire selector, magazine release and surprisingly ambidextrous flip up sights. 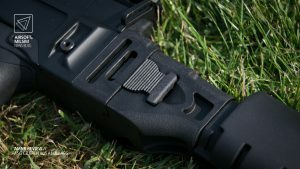 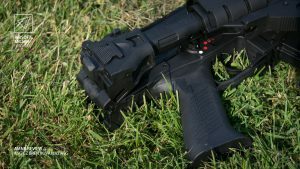 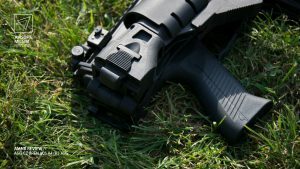 It is nice to see that the pistol grip (albeit unique and non replaceable), has the potential to have different back straps applied to it to accommodate for many hands. 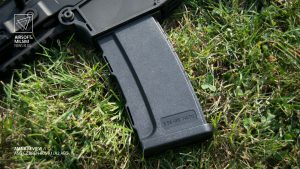 The main issue to this statement is that to this date, these back straps are yet to be released. 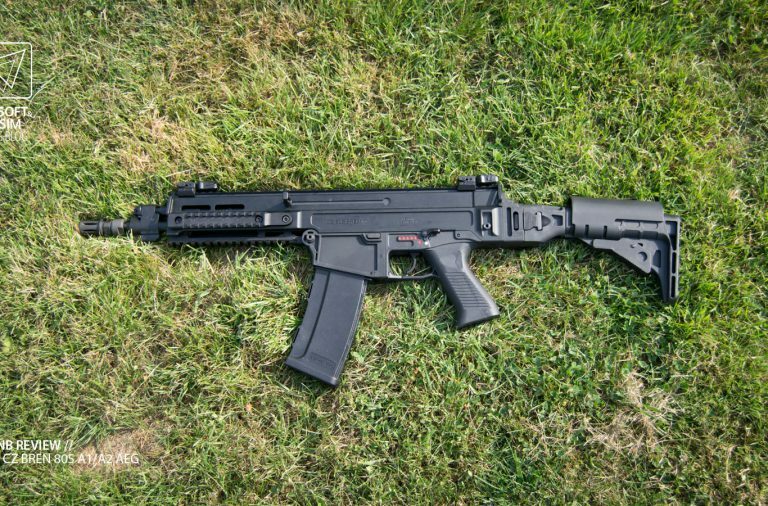 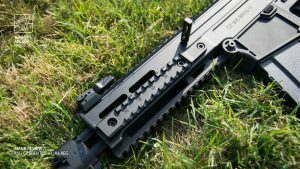 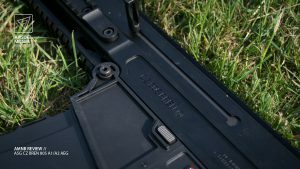 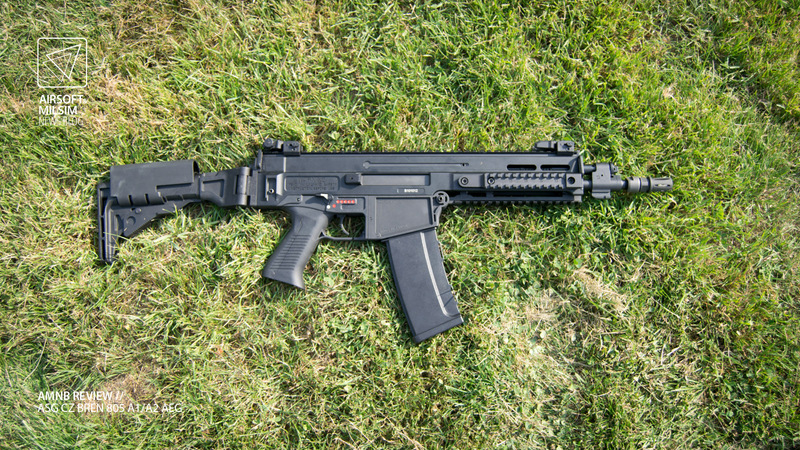 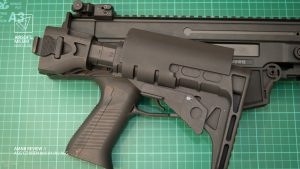 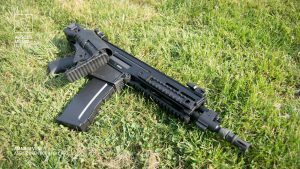 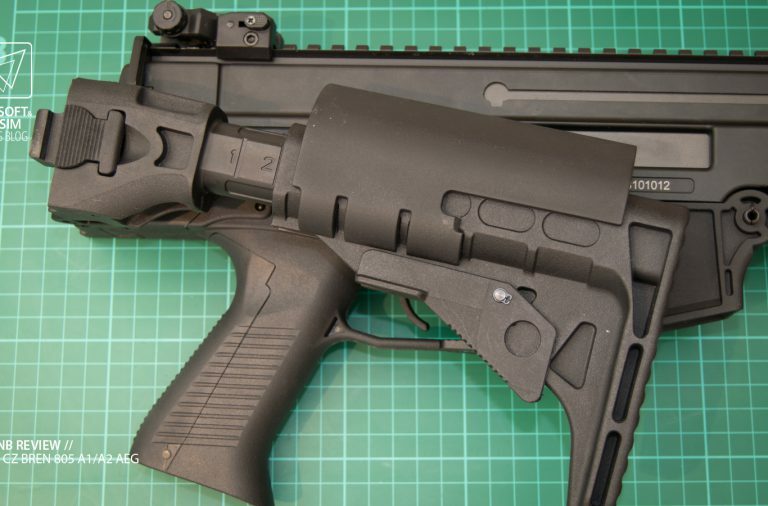 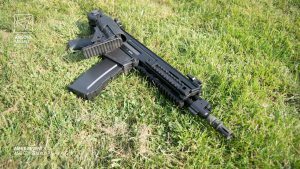 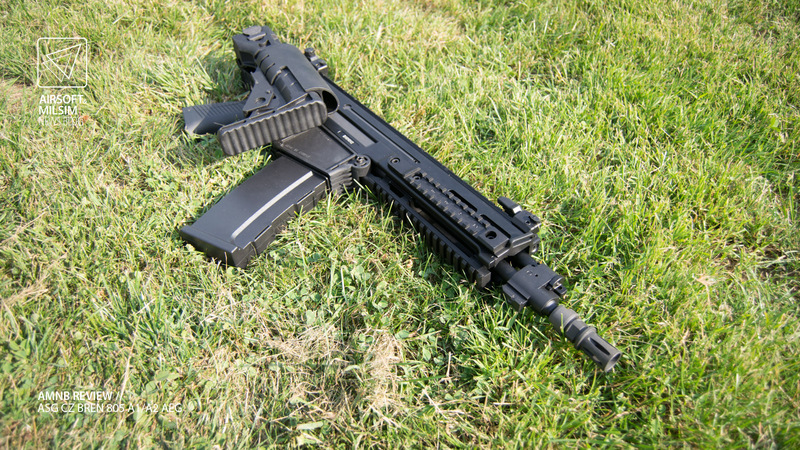 The ASG CZ Bren 805 uses a proprietary magazine based on the real counterpart, however due to the basis of how the magazine is designed, it is possible to use certain brands of G36 magazines (some may cause miss feeding). 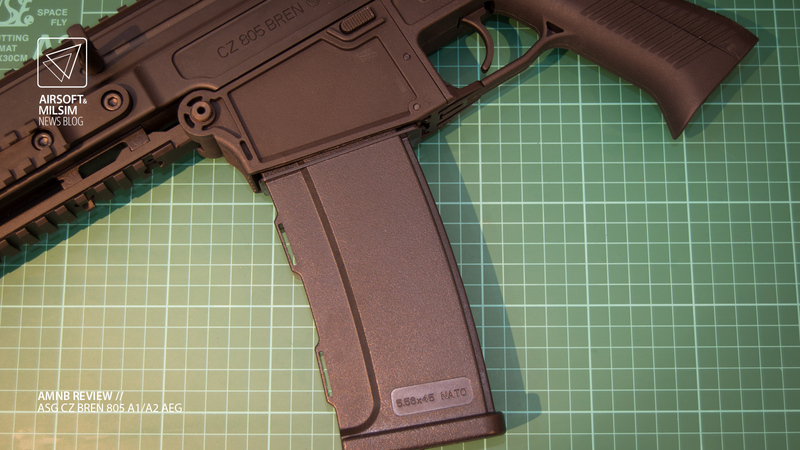 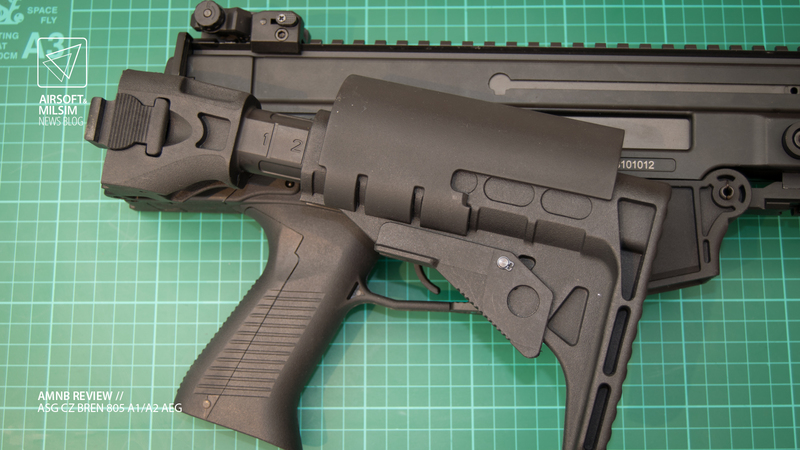 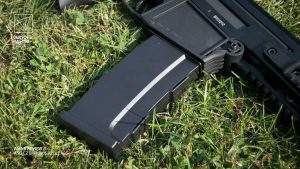 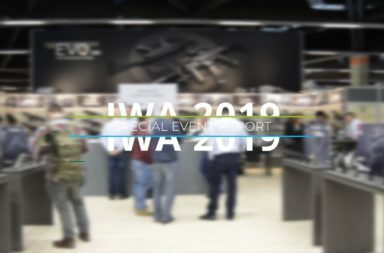 Unfortunately, if you do not want to use G36 magazines and want to keep the authenticity of using the Bren A2 magazine, you will have to keep to using high capacity magazines. 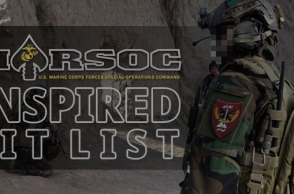 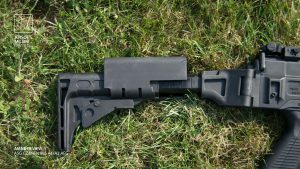 To this date there are no Bren specific mid capacity magazines available. 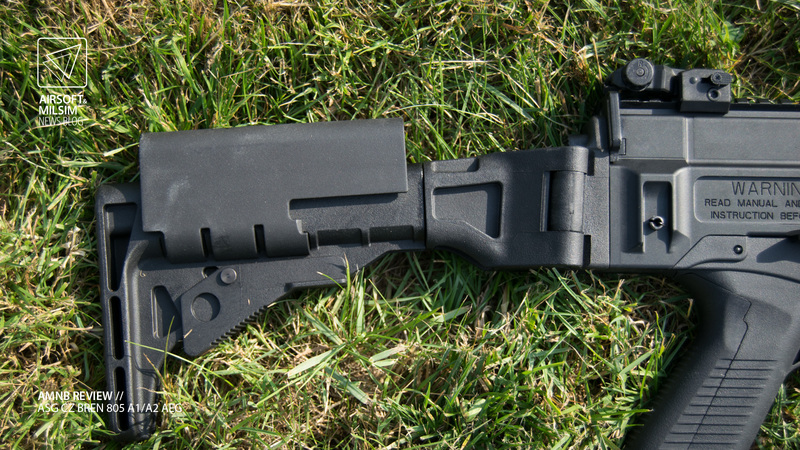 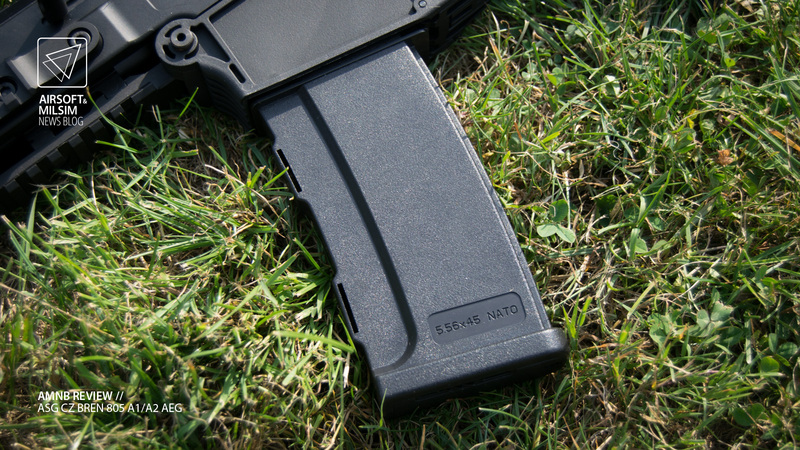 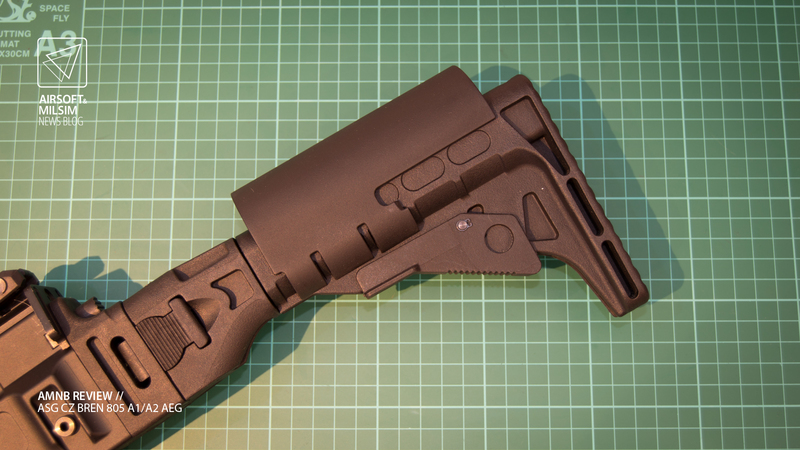 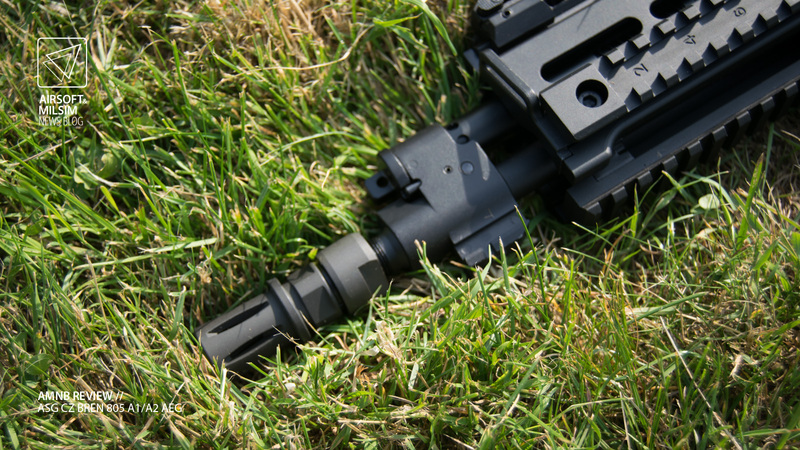 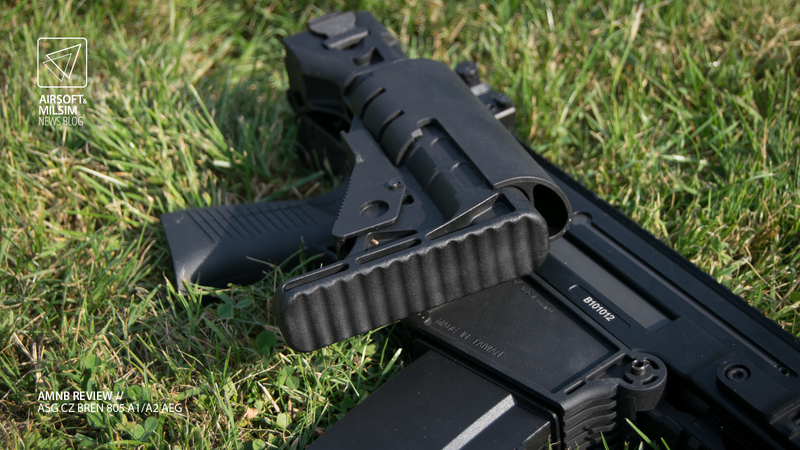 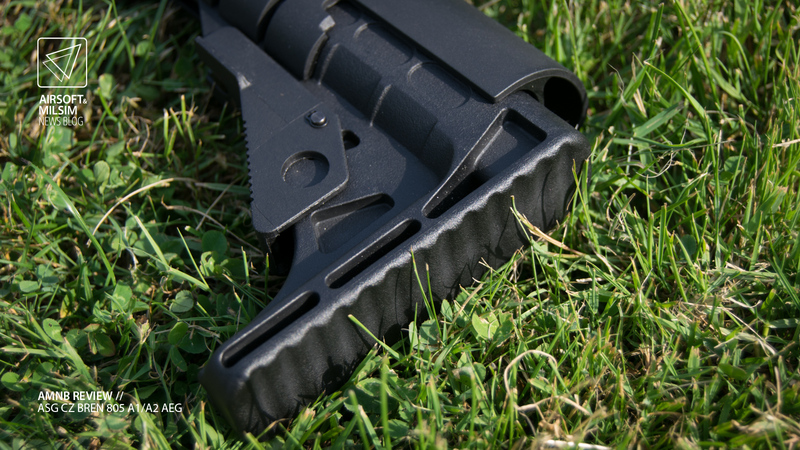 NOTE: A replacement mag well is being released in the near future to accommodate the use of M4 style STANAG magazines. 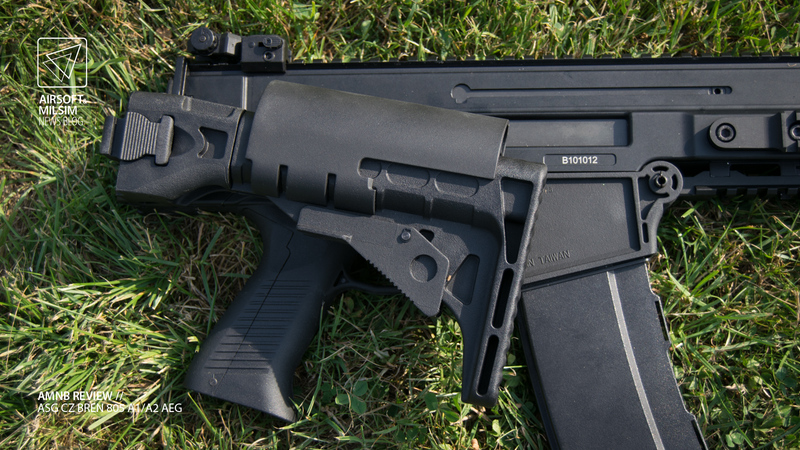 One of the most advantageous features of the Bren 805 is the telescopic, and foldable stock. 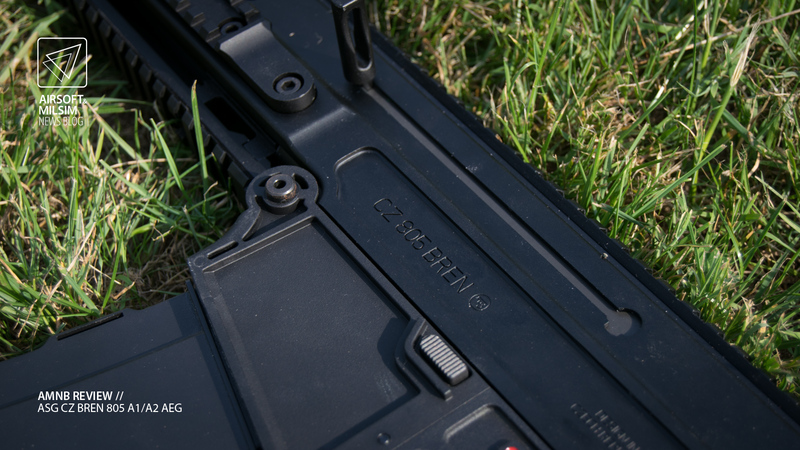 The ability to make the profile of the rifle compact and be able to adjust it for different arm lengths, gives this rifle a lot of versatility in the field. There is a slight annoyance depending on the positioning of the telescopic stock. 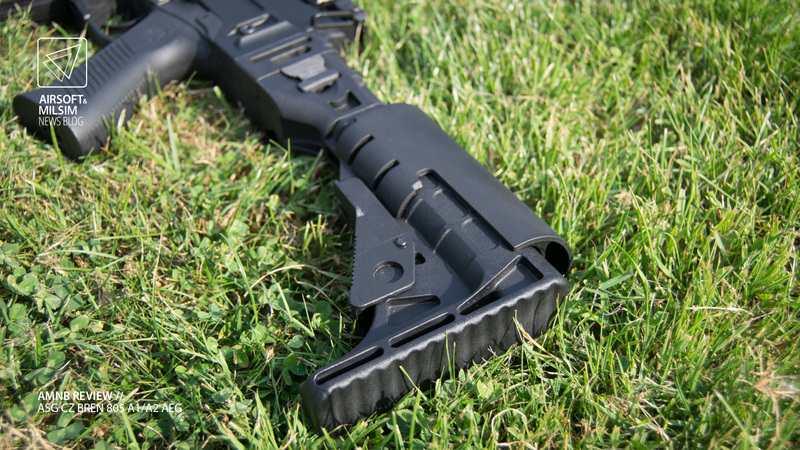 Unless the stock is at a position longer than one, the trigger guard will be somewhat blocked whilst the stock is collapsed. This is however not an issue for left handed users. 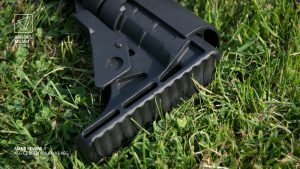 The stock also comes with a cheek riser which is adjustable in three positions (potentially five positions if the stock is extended further). 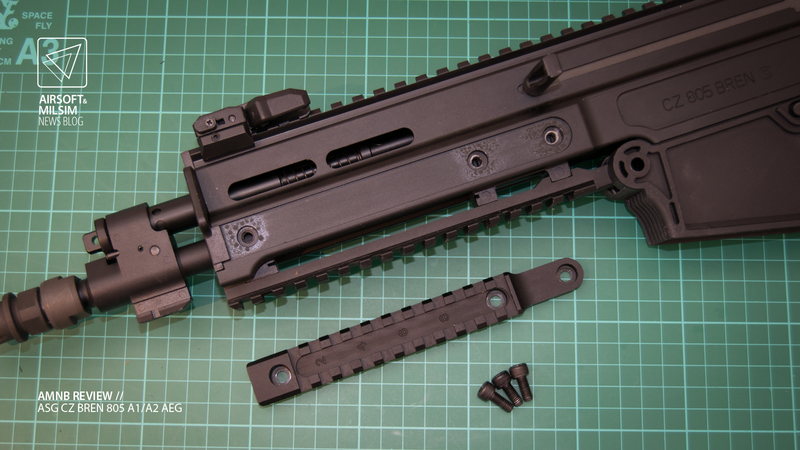 At the end of the upper receiver, you can also find sling mounts on either side however, these mounts (which are also available at the front end) are quite narrow and may not clip very well to certain slings. 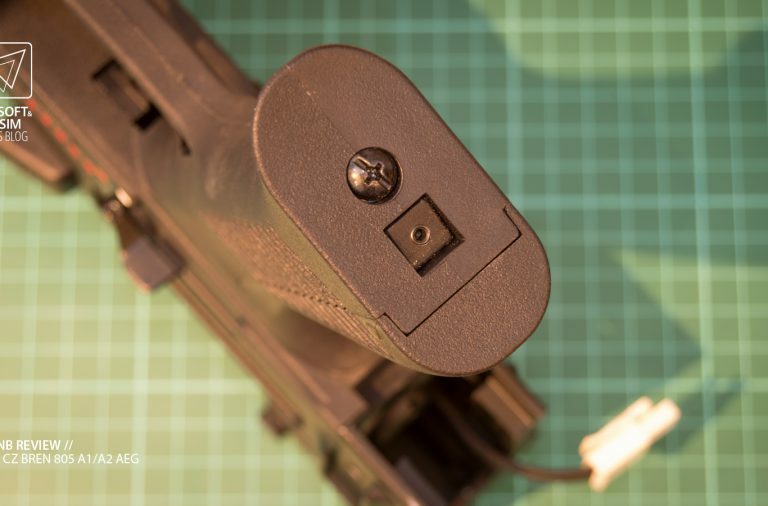 The hop up dial is found behind the fake bolt and can be accessed by pulling back the charging handle. Unfortunately you cannot lock the fake bolt back but that is not an issue if you can prop the rifle and hold the handle back with one hand, keeping the other hand free to adjust the hop up dial. 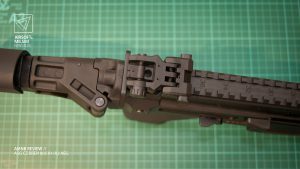 As you may notice in some photos, the charging handle can be interchangeable and hence has been changed in some photos. 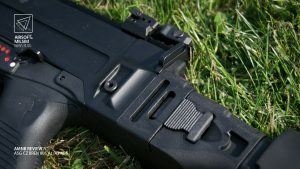 This is merely a function for the user and does not change the operation of the rifle as such. 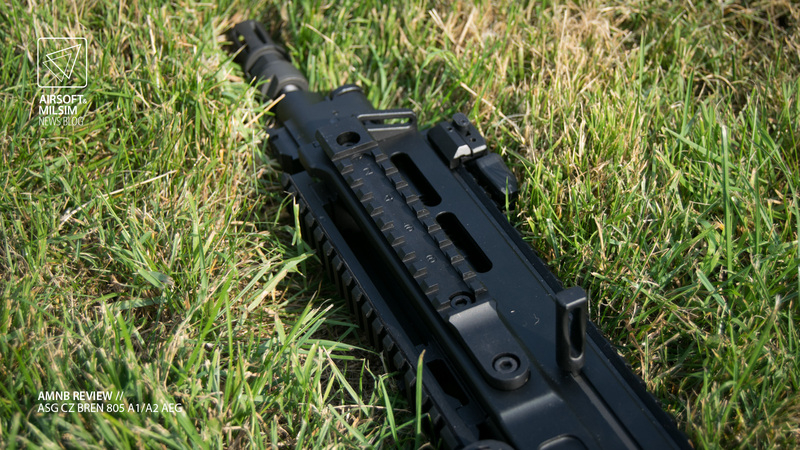 Moving to the front section of the rifle, you can see that the entire top side is a monolithic RIS rail system which is accompanied with two flip sights with wind adjustment on the rear post and elevation on the front post. 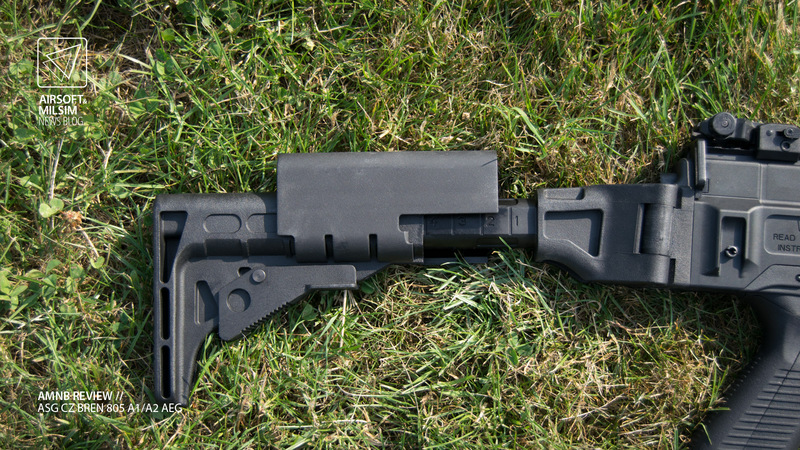 These sights are made out of polymer however they are spring operated and can be released on either left or right side. 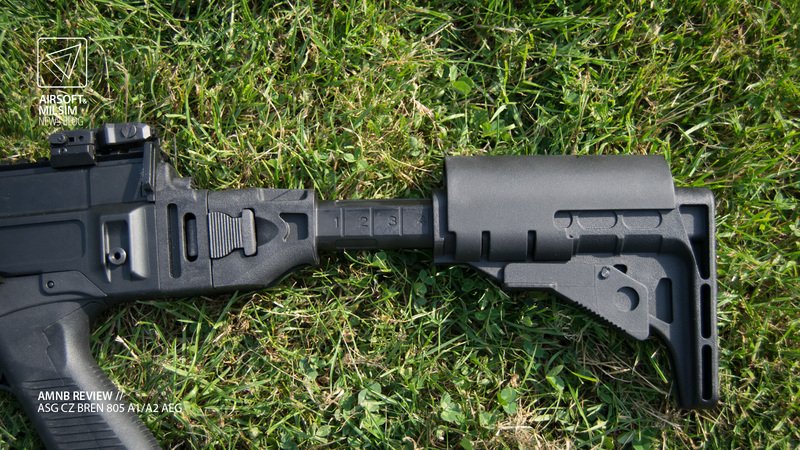 Where the front end meets the mag well, both sides and underside of the front hand guard continues along the barrel as a quad rail RIS system. At the end of the front end, as mentioned before, there are two sling mounts at the front to accommodate two point slings. 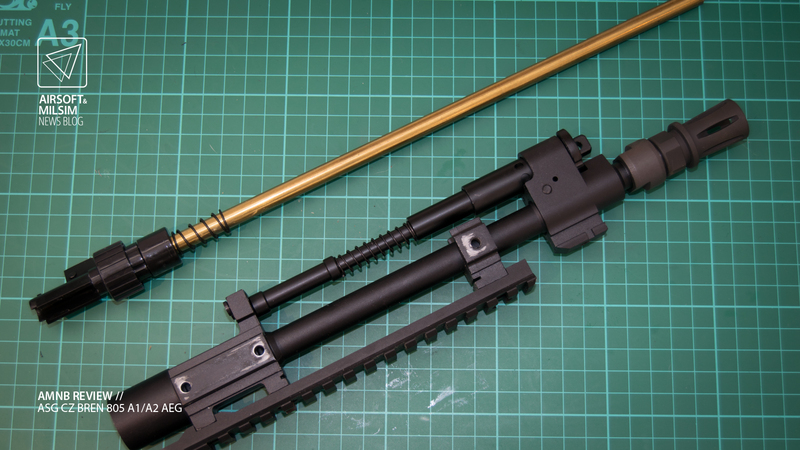 The gas tube sticks out of the hand guard and does not provide a function other than mimick the real counterpart. 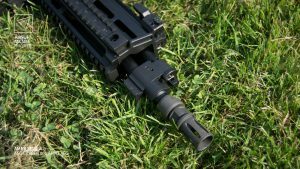 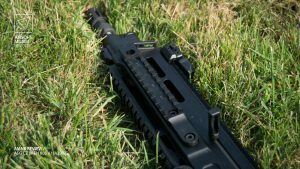 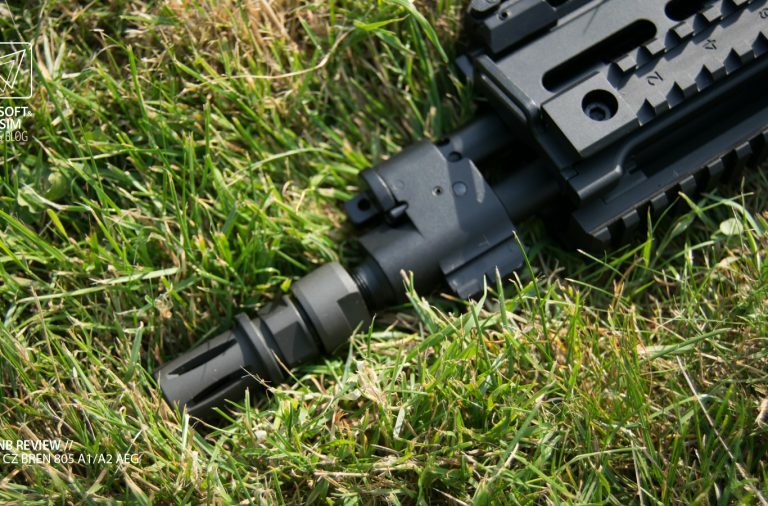 One impressive notion in the design of the Bren 805 is the two part flash hider which allows for the thread to be adjusted for other muzzle devices. 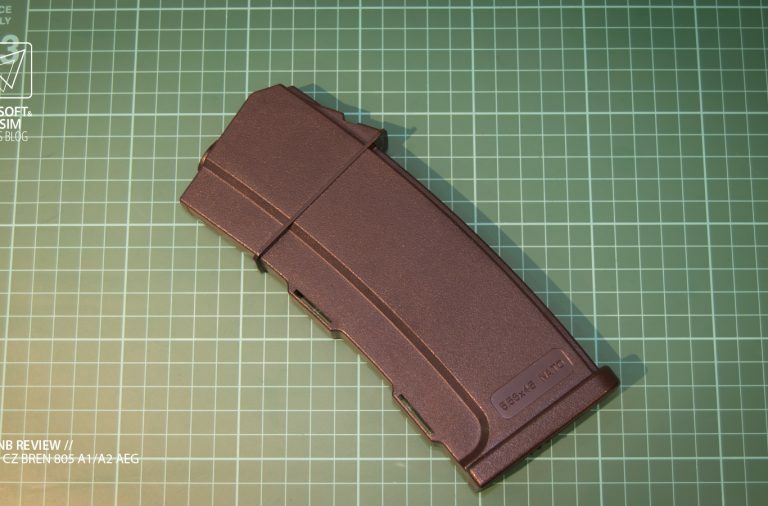 Although quite a simple idea, this should be a standard for any CW or CCW threads on replicas in the direct future. As known with the real counterpart, the upper receiver is made of metal and the lower receiver is a polymer which includes the stock. 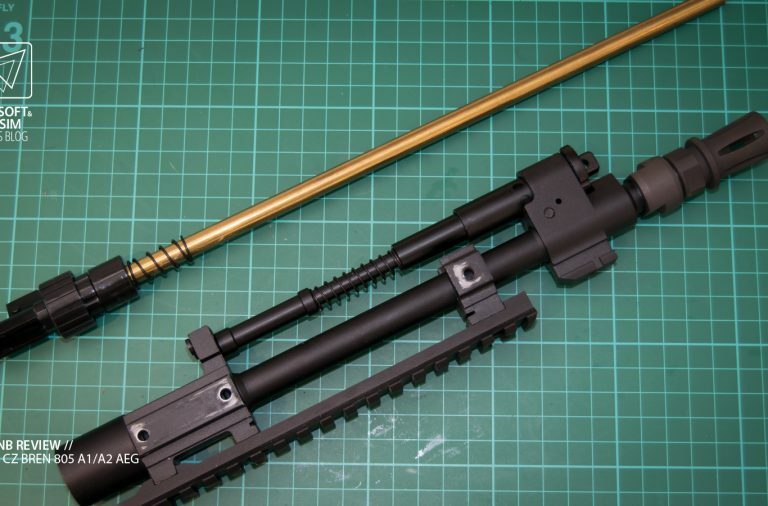 Other parts such as screws and pins are made of metal however are not as well painted and treated due to light rusting when tested in the outdoors for a prolonged period of time. 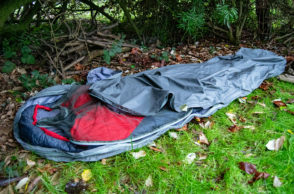 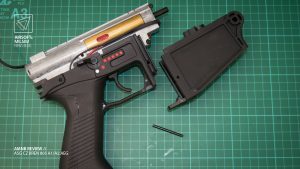 This is not a huge issue as these circumstances are extreme and only result if the replica is left in a moist environment for a long period of time. 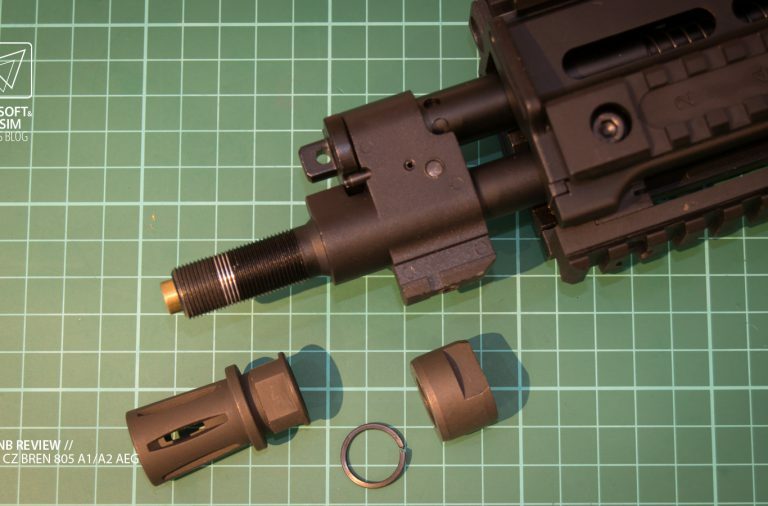 The thread that is covered by the flash hider is a long 14mm CCW thread. 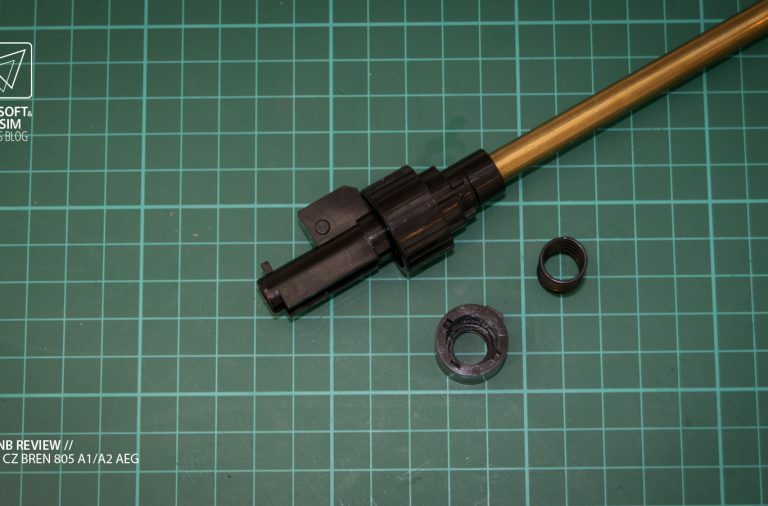 Although the thread is long, the nut on the end of the thread can be adjusted to whatever length is required. 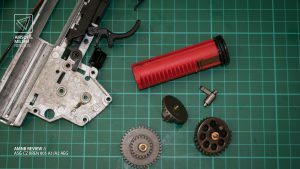 This also means that the chances of getting a thread stuck are minimal in comparison to doing so to the end of a thread (cross threading does not count). 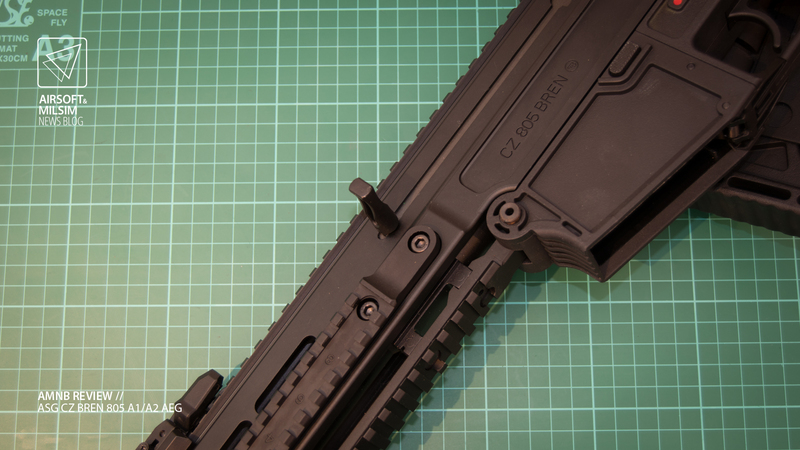 The stock is made out of polymer and feels quite robust due to the strength and elasticity of each component. It will be quite difficult to try and break these components whilst playing Airsoft, however if you try hard enough, you will surely get what you want to happen. 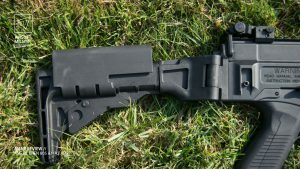 I have to say, for a stock that has so many moving parts, it is one of many rigid and secure stocks I have felt on a replica. 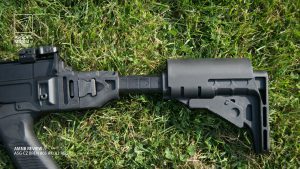 Over time, the only wiggle room I could find was in the telescopic stock when it isn’t pressed against the shoulder. 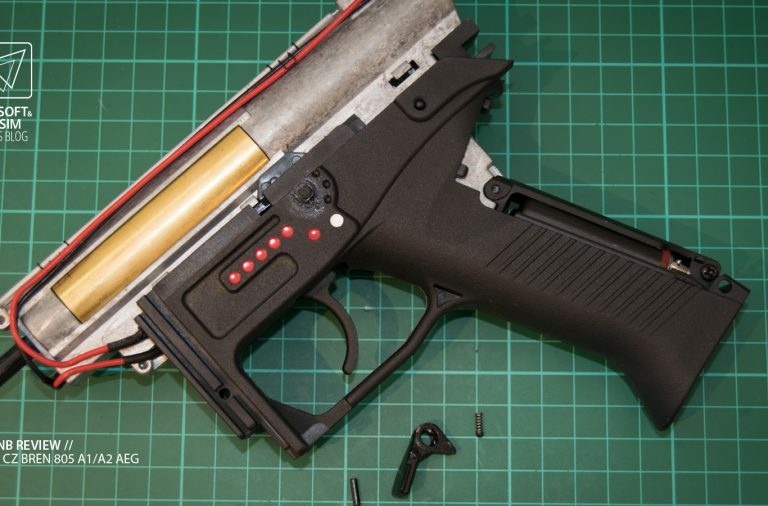 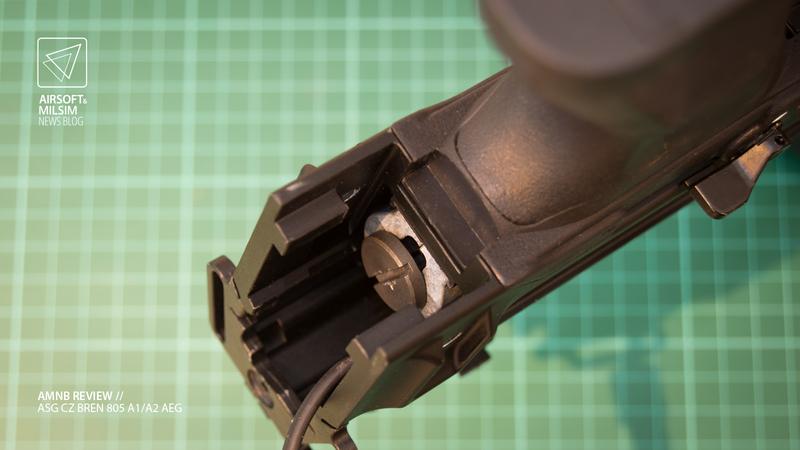 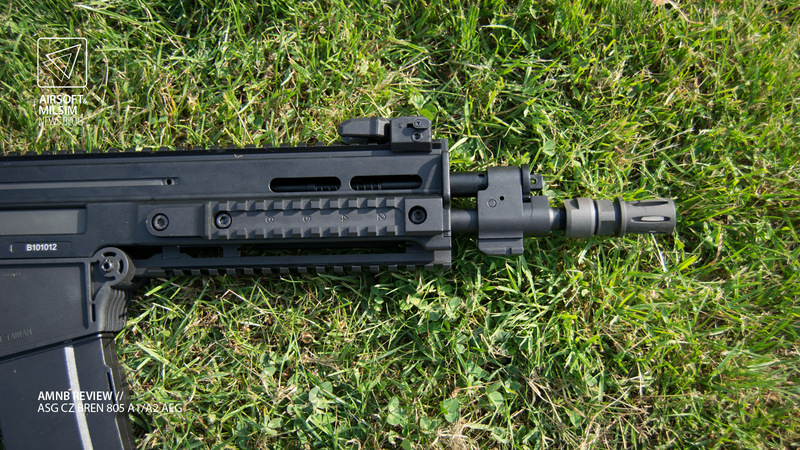 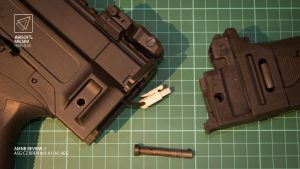 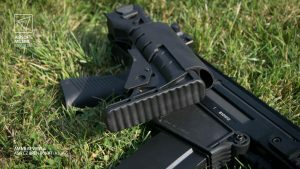 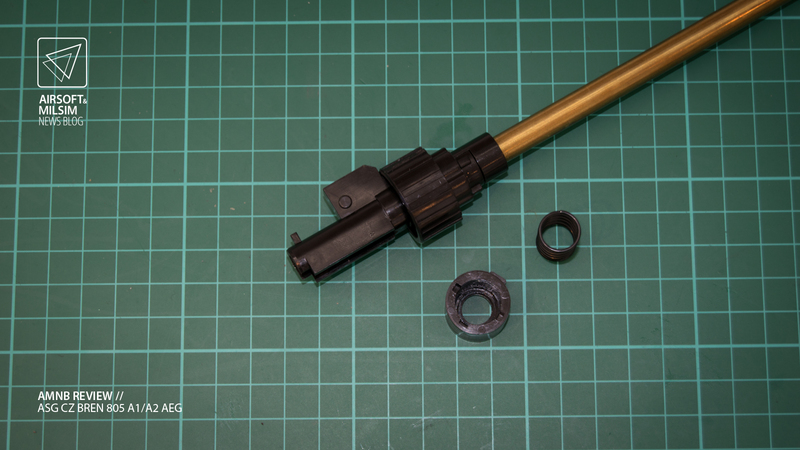 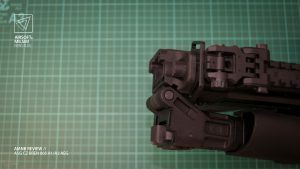 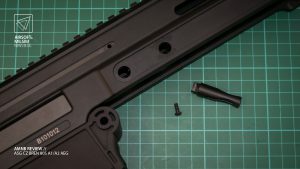 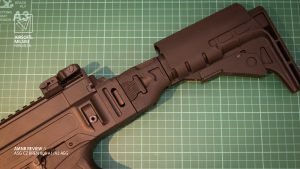 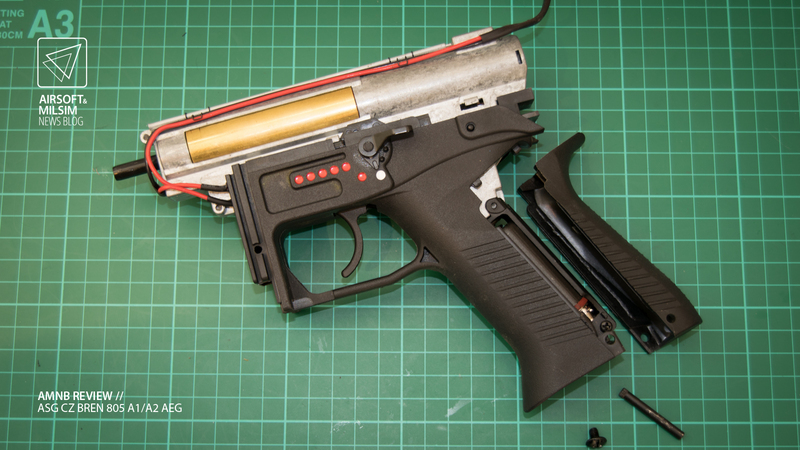 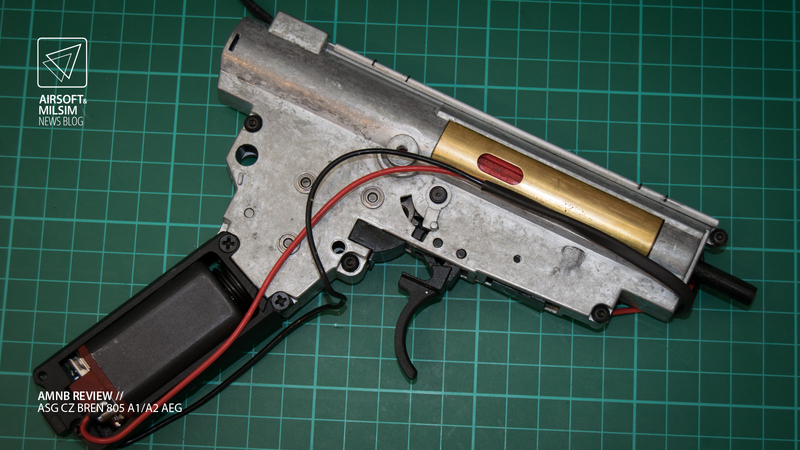 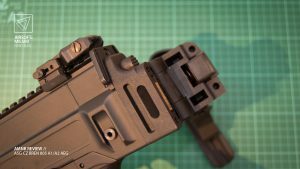 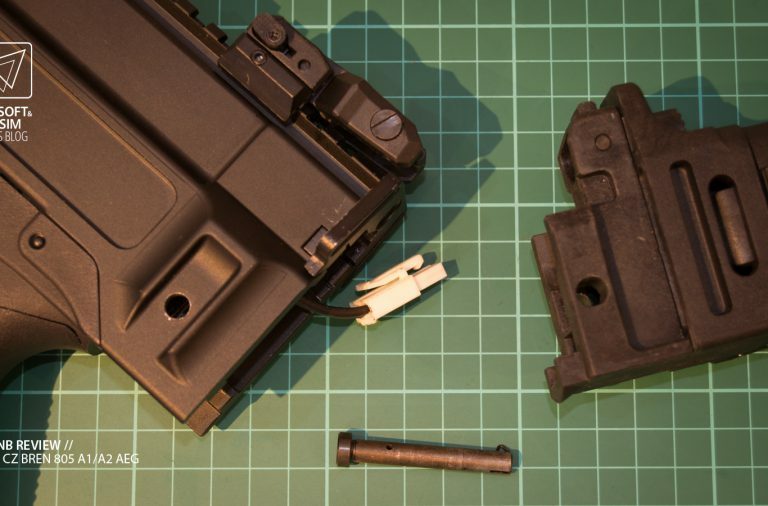 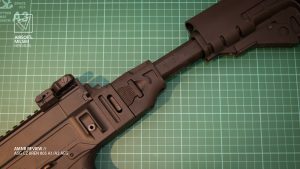 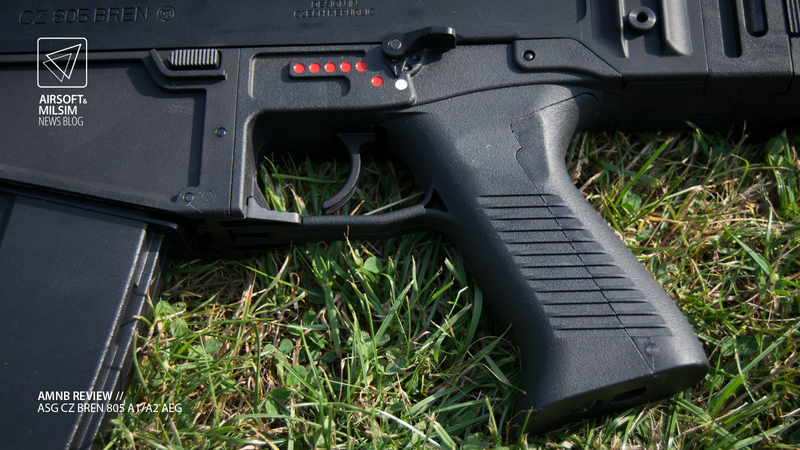 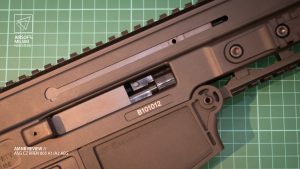 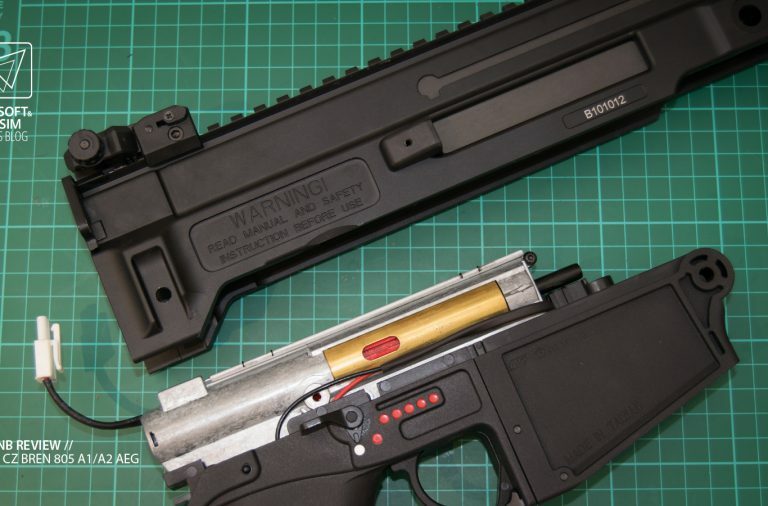 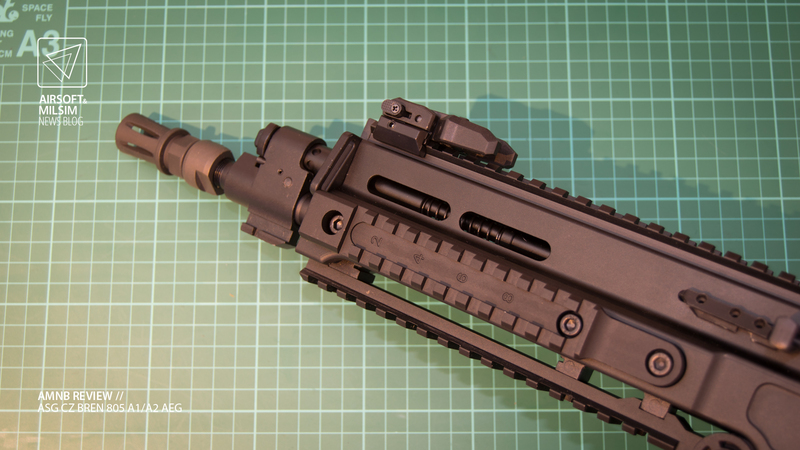 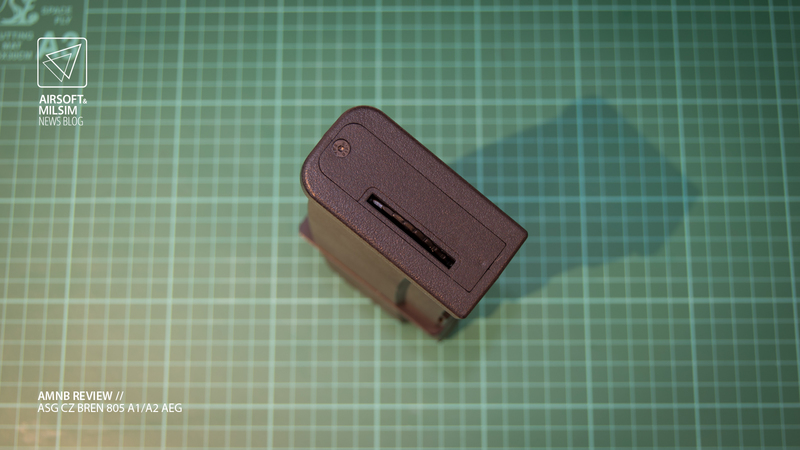 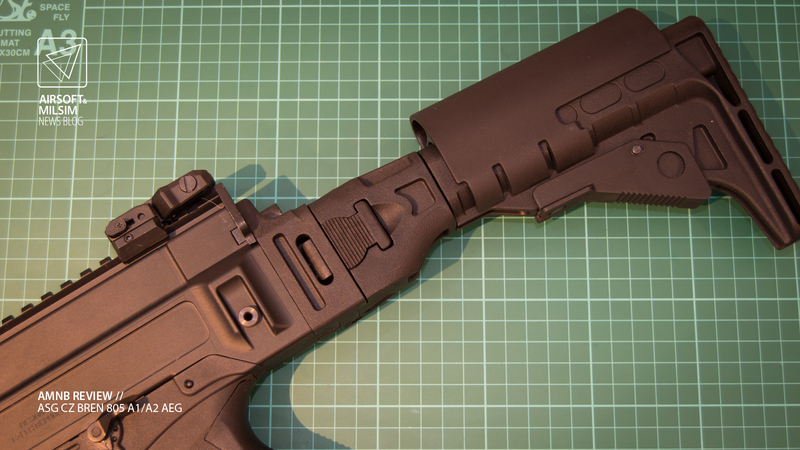 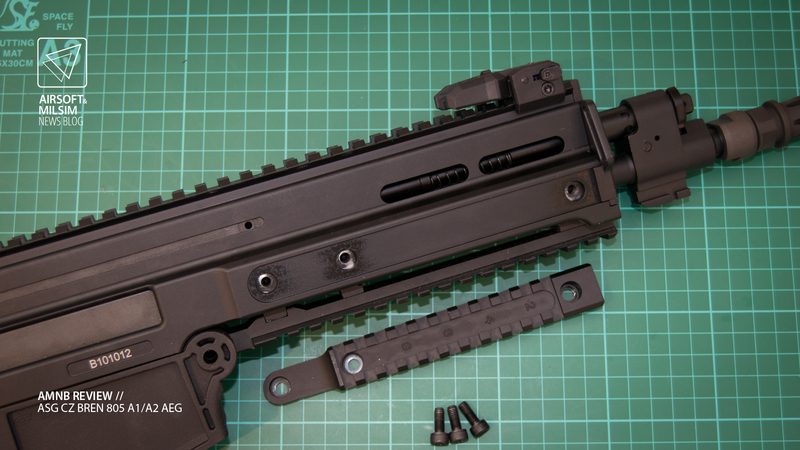 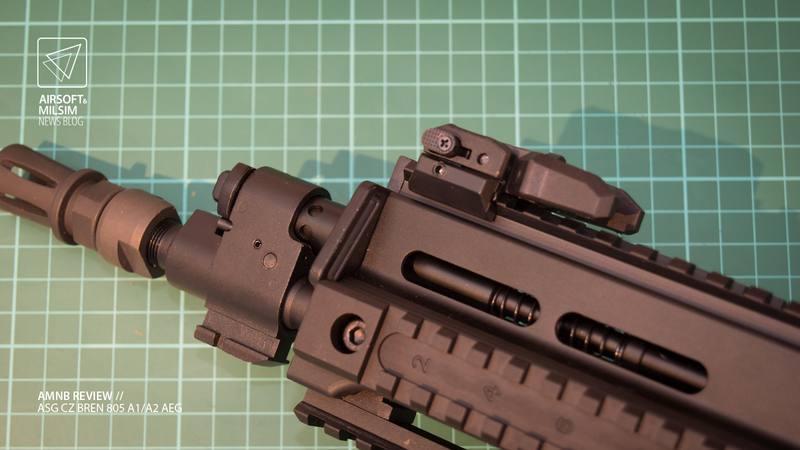 You can access the battery connector and quick change compartment of the gearbox by pulling out the rear pin of the upper receiver. 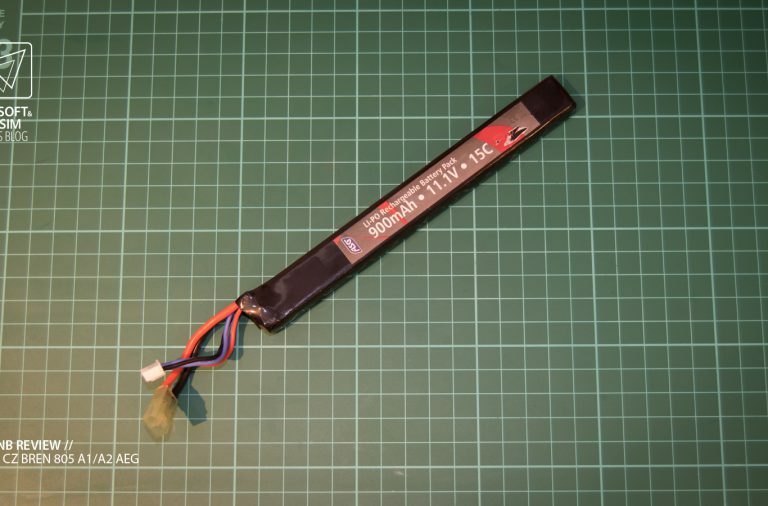 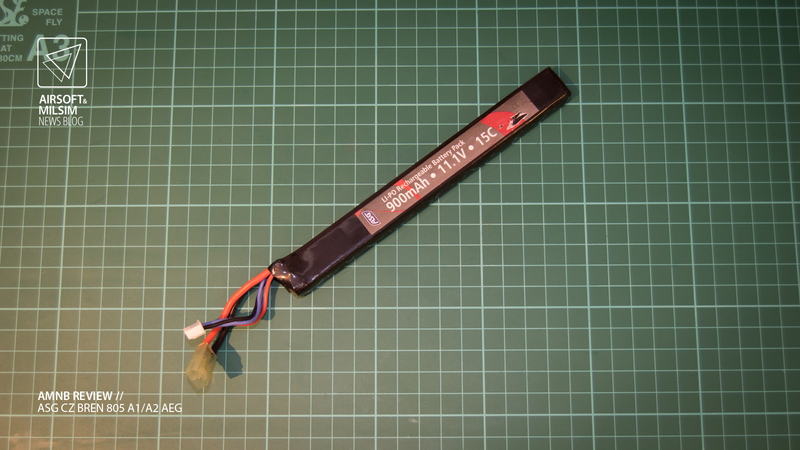 Please be aware that the battery compartment is quite narrow and small. 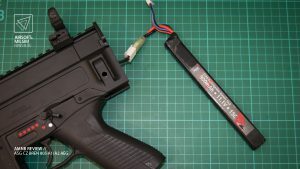 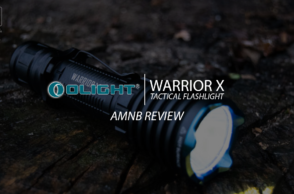 It is recommended to find the right dimensions for the battery or getting the recommended battery from ASG for this replica. 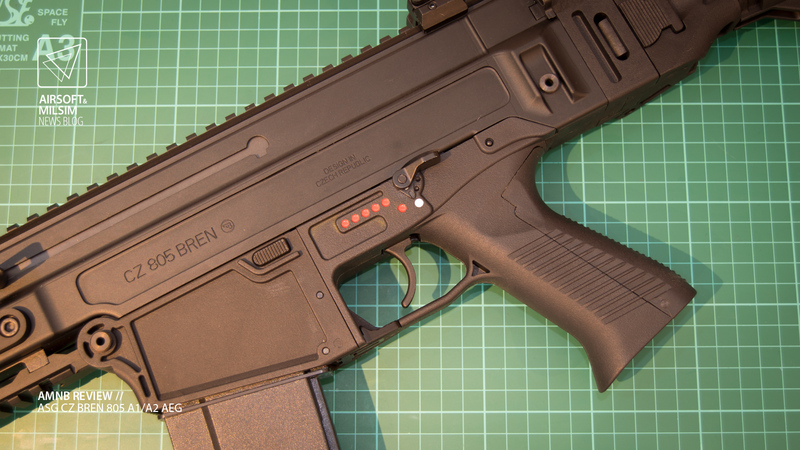 The ASG Bren 805 is recommended to be used with an 11.1v LiPo but I am sure it will work with anything as low as a 7.4v battery as well. 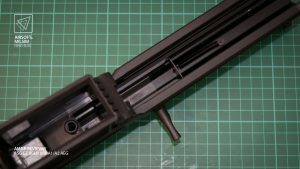 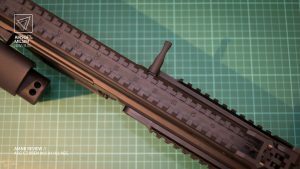 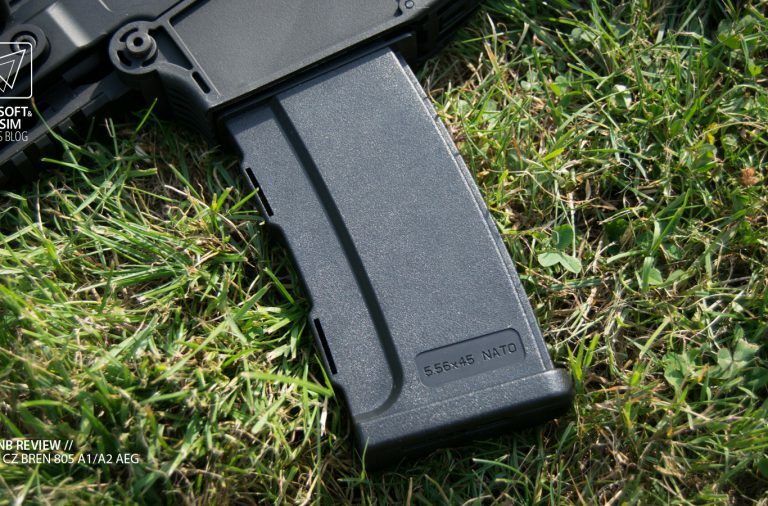 The high capacity magazine that comes with the Bren 805 is made of a light polymer with a small door at the top for filling with bbs and a winding wheel at the bottom to wind the spring. 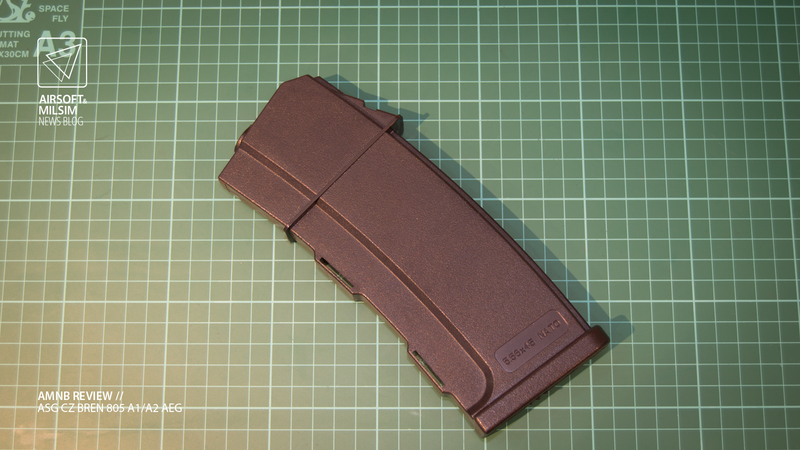 Although the magazine is light, it is well structured and does not flex under pressure. 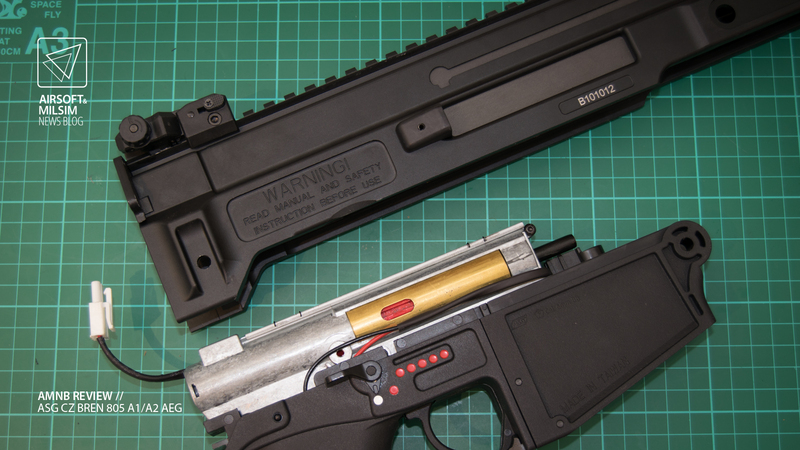 The magazine has a capacity of 550 bbs and unfortunately does not have a mid capacity variant… yet. 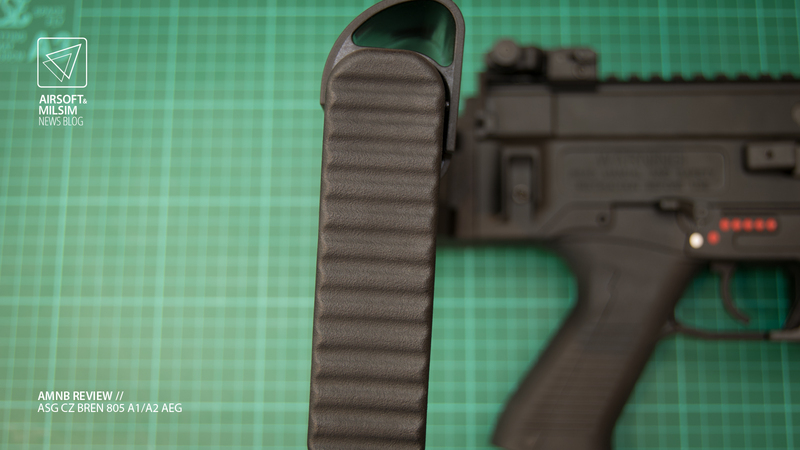 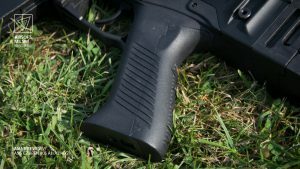 The pistol grip has a pin on the back which allows for the back strap to be removed. 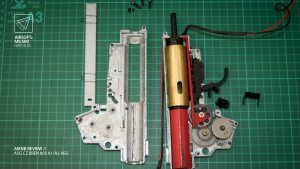 The allen screw acts as the adjustment screw for the motor and the Phillips screw keeps the motor cage in place. The back strap and pistol grip are made of a strong polymer which don’t flex either, however you can feel the motor heat up after prolonged use. 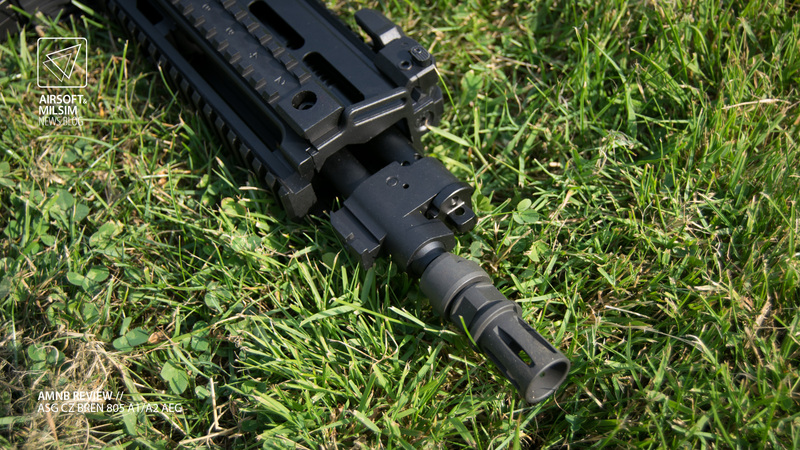 This of course is not an issue and is a common occurrence with most AEGs with a high torque motor. 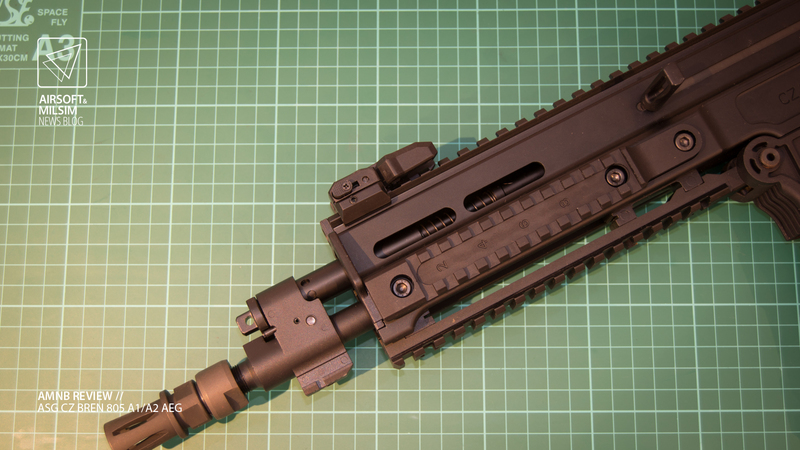 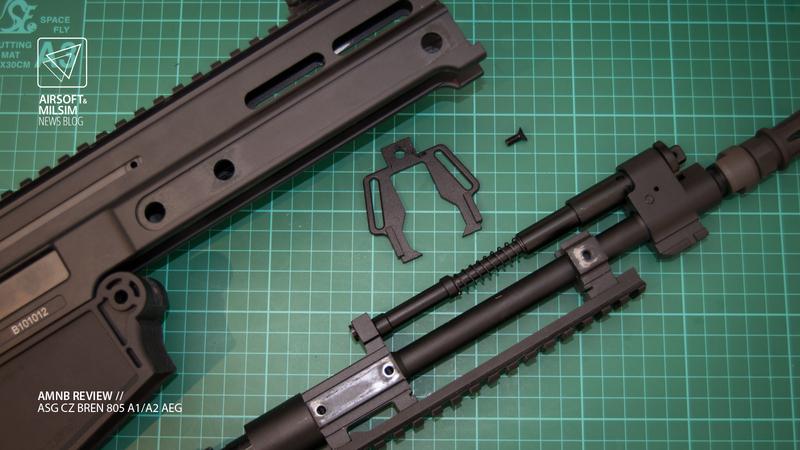 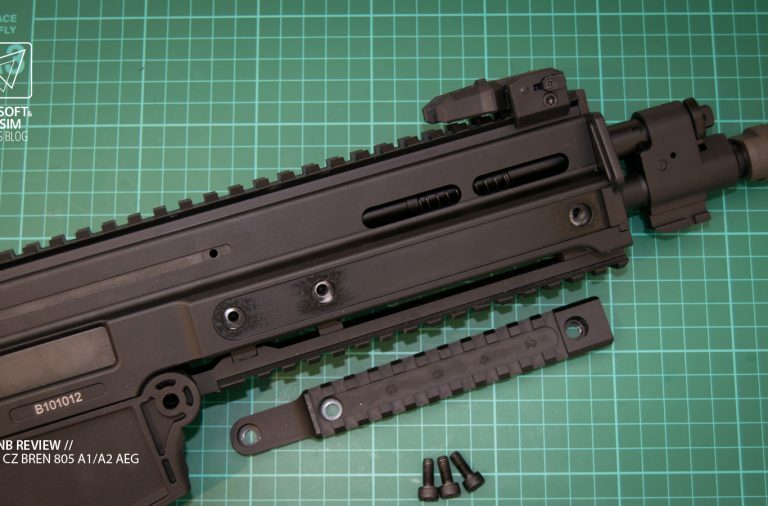 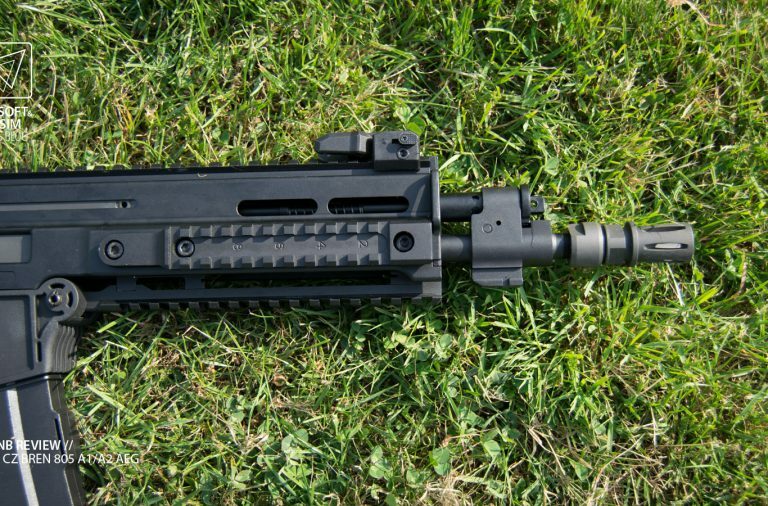 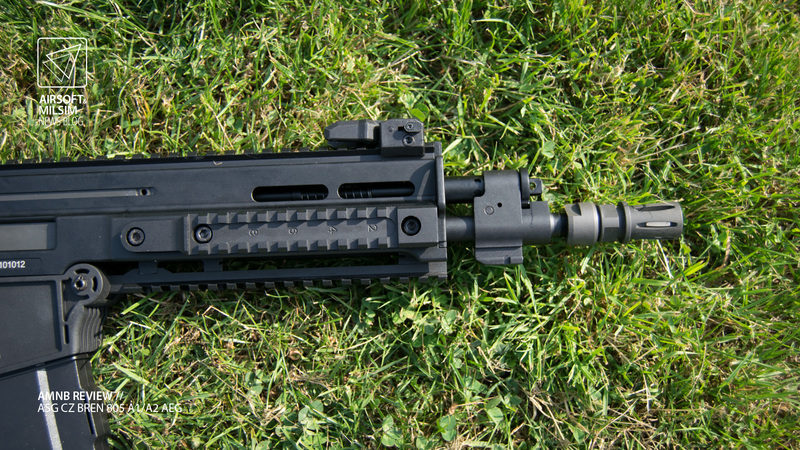 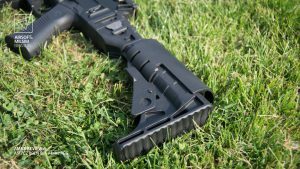 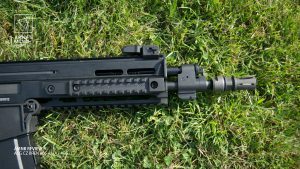 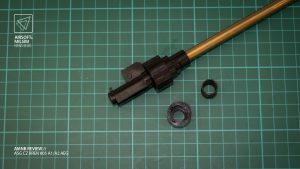 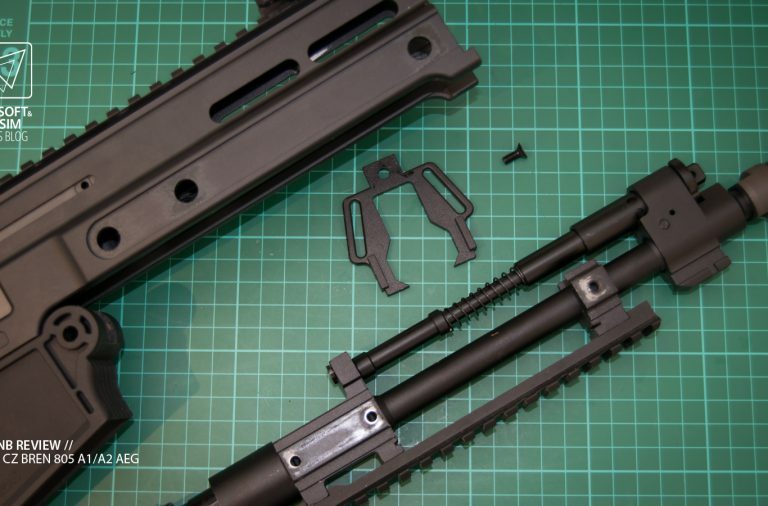 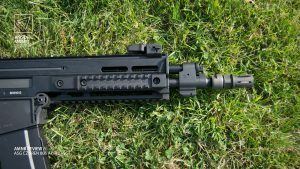 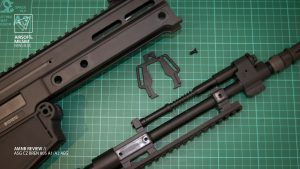 To remove the outer barrel, the front screw above the gas tube and the rail system on both sides can be unscrewed which allows for the outer barrel, gas tube and sling mounts to be removed from the upper receiver. 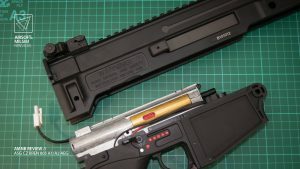 The paintwork on both outer barrel and upper receiver is very high quality and has yet to scratch easily from general use. The outer barrel comes out with the bottom rail section attached. 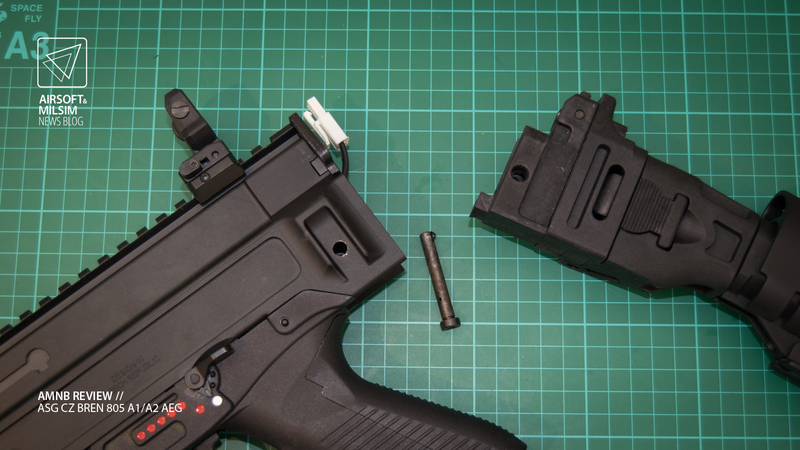 With the outer barrel removed, the hop up unit can be removed. The fake bolt and the charging handle can also be worked on without having to disassemble any other part of the Bren 805. 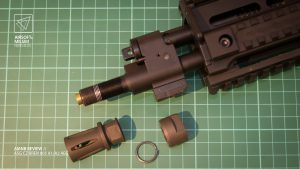 The inner barrel is retained in between the gearbox and the outer barrel using the spring that lays on the inner barrel. 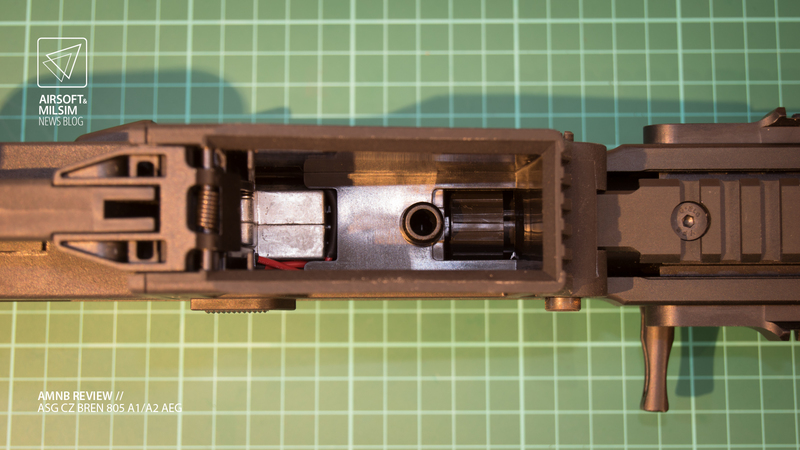 This keeps a good connection between the gearbox and the hop up unit, however this form of engineering has proven to cause miss feeds in some AEGs in the past. 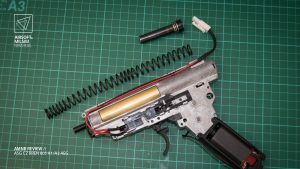 This is mainly due to the spring not being strong enough to handle the recoil vibrations of the gearbox in full-auto fire. The upper receiver can be removed from the lower receiver by removing both pins on the back and front of the lower receiver. You may find that the gearbox is still securely tight in the lower receiver due to the screw in the motor cage. 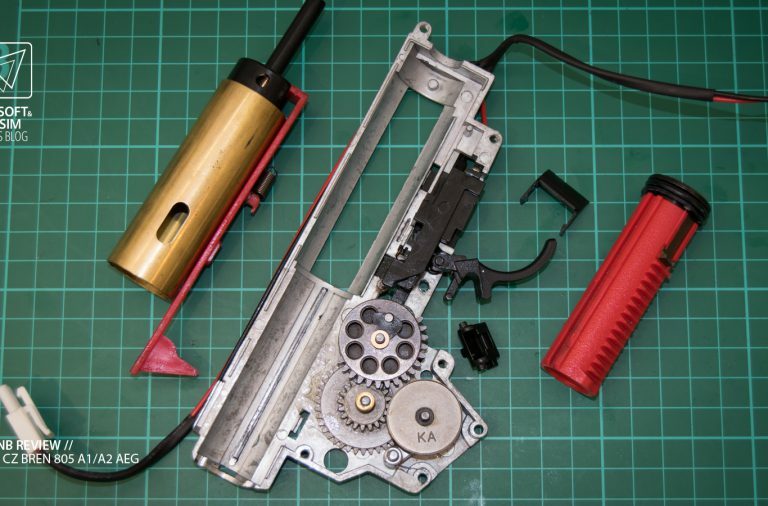 It is worth taking note that if you desire to take apart the gearbox, you should remove the AEG spring to ensure there are no tensions when taking the gearbox apart. 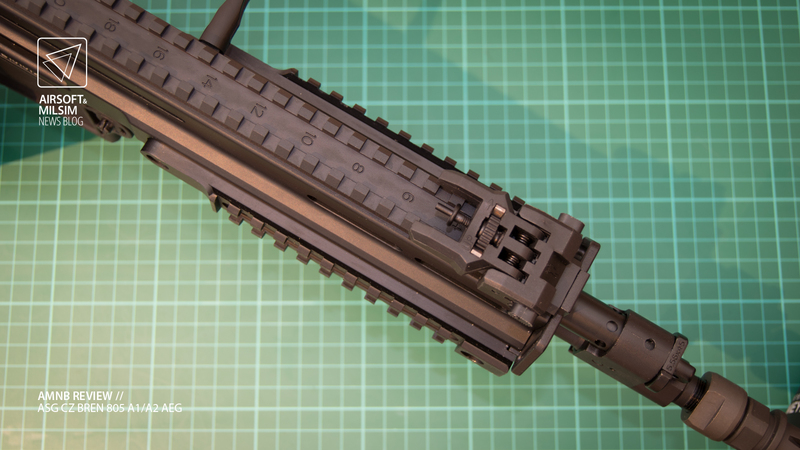 Carrying on from where we left off with the outer barrel. 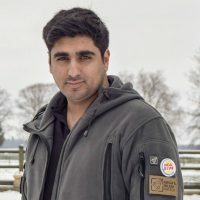 The hop unit is a simple rotary design which is in two parts. 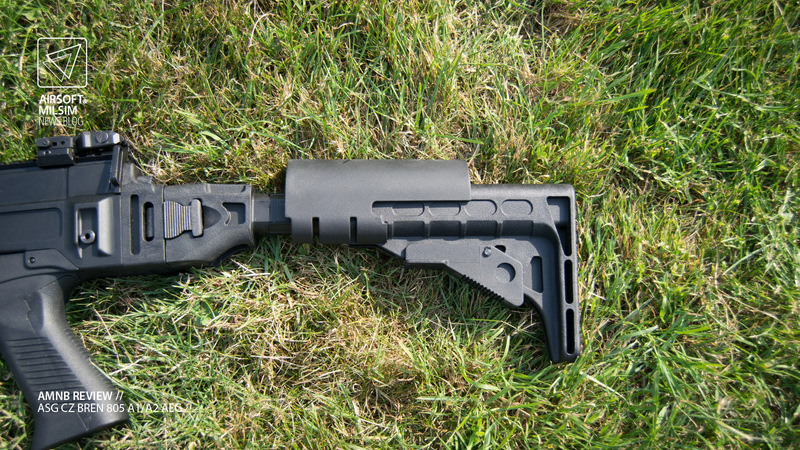 The other part is from the mag well part of the lower receiver. 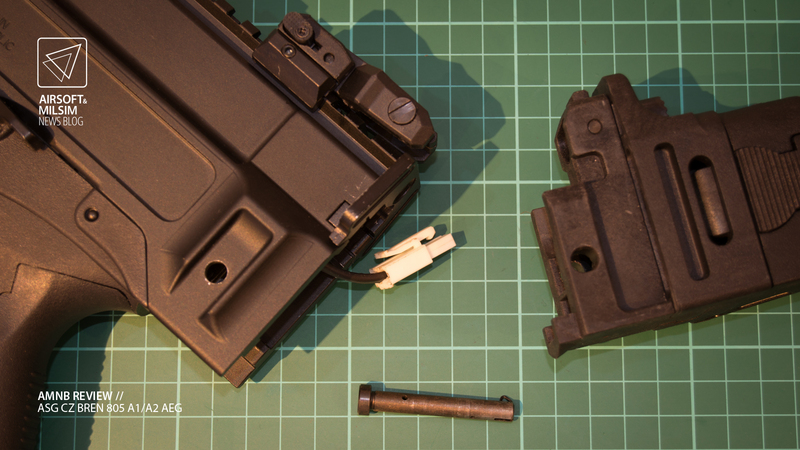 The hop up unit easily comes apart so be careful when working on it. 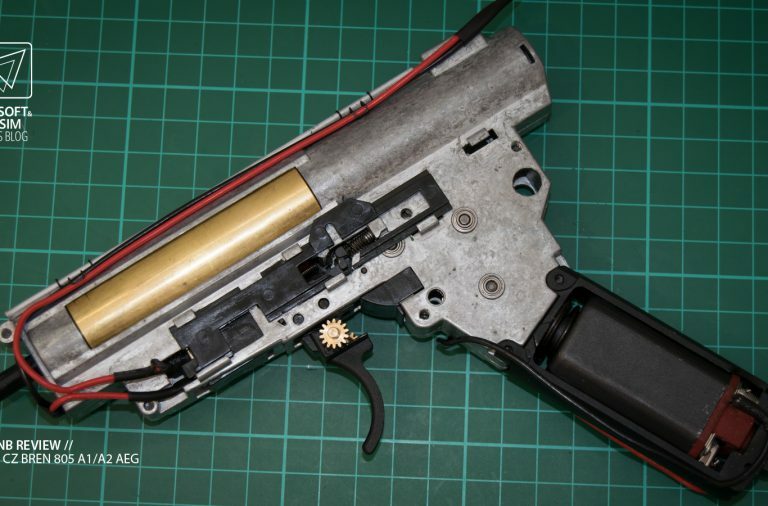 I unfortunately do not know what the inner barrel dimensions are but can only assume they are 6.03 mm in diameter. 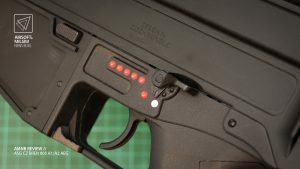 The fire selectors can be removed by punching the tiny pins but remember that there is a spring retainer that clicks the fire selector into place for the different fire modes. 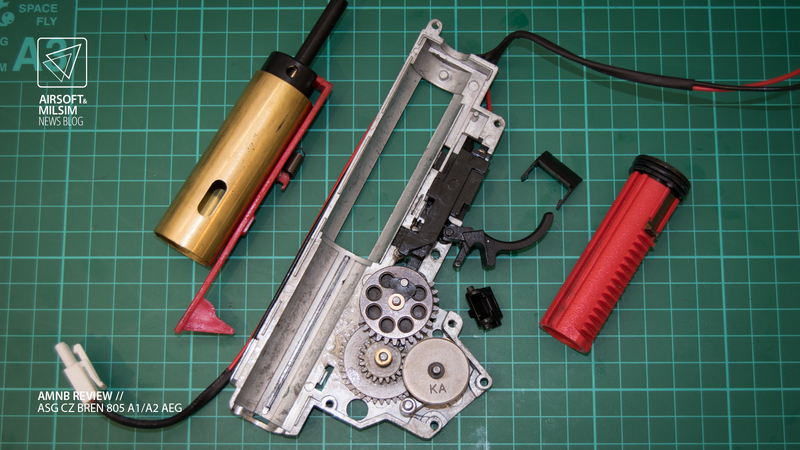 It is convenient to find that the wiring has been secured into place by clips that run along the top of the gearbox. Removing the gearbox can be a pain unless you know what is stopping it from coming out of the lower receiver smoothly. 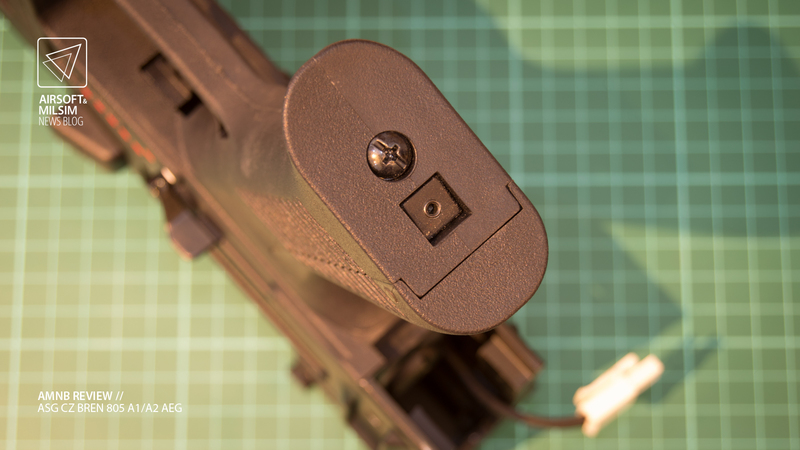 The fire selectors are linked by a small pin with gears on either side of it. 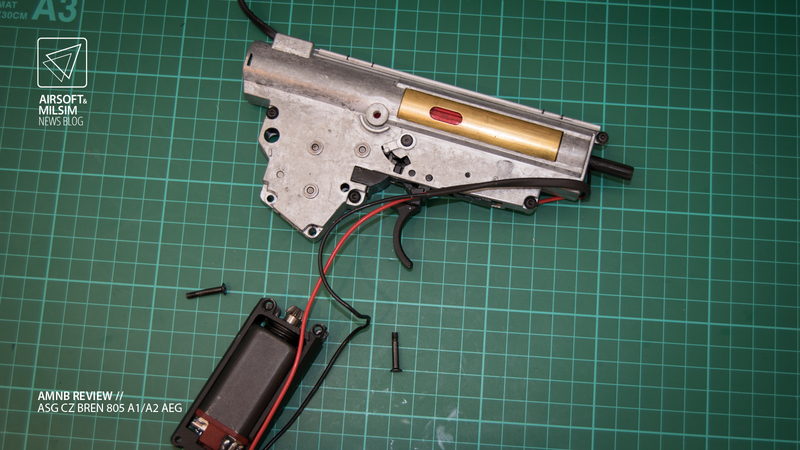 This tends to get stuck and requires the fire selectors to be turned so their inner frames can give way to the pin. NOTE: There is a reason why it is recommended to allow a more experienced technician perform work on your replica. 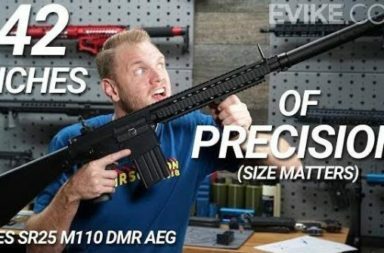 This is one of those reasons. 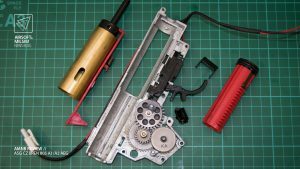 Once you have opened up the gearbox, you will find the typical assortment of version 3 gearbox parts which include a ported cylinder and what you’d normally expect to find in a typical AEG gearbox. 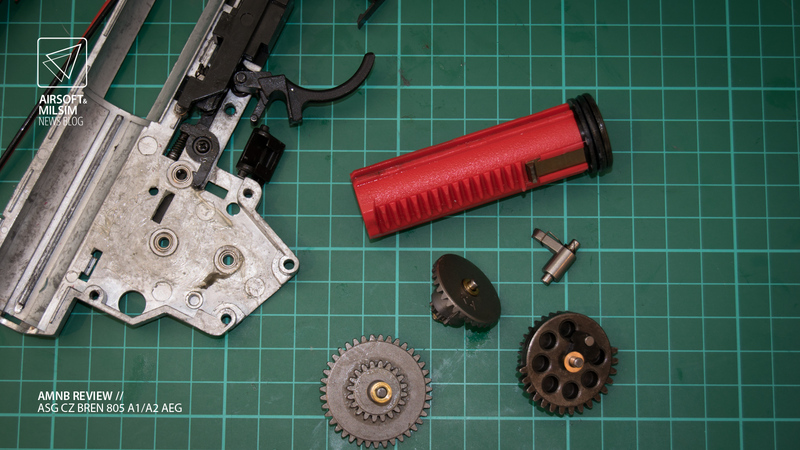 Other than the fact this is what the parts look like after extensive testing with little to no wear and tear, there is nothing special about this gearbox compared to what’s expected. 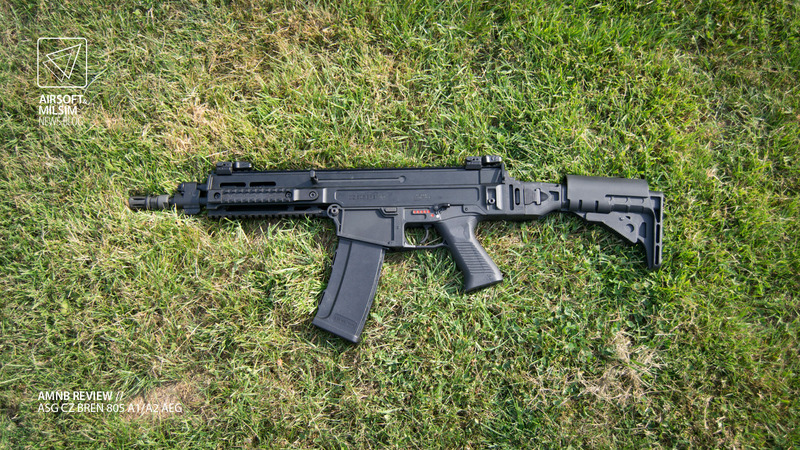 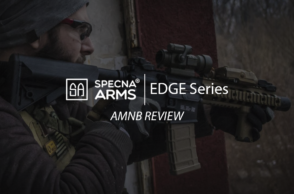 The ASG CZ Bren 805 AEG performs well as an AEG on both semi-automatic and full-automatic. 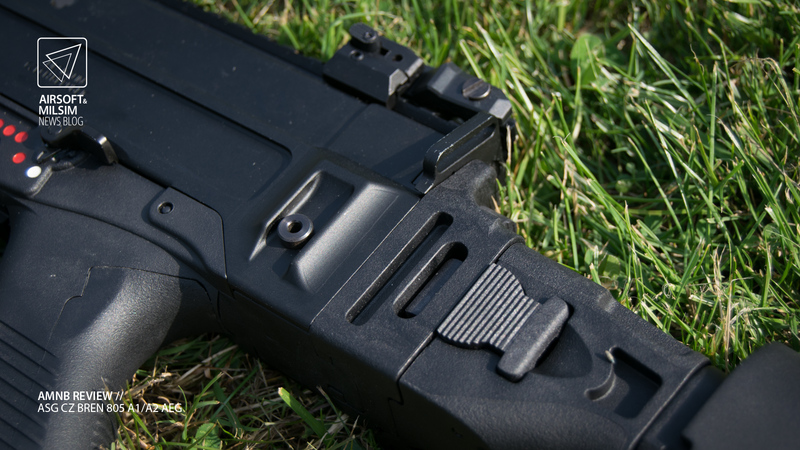 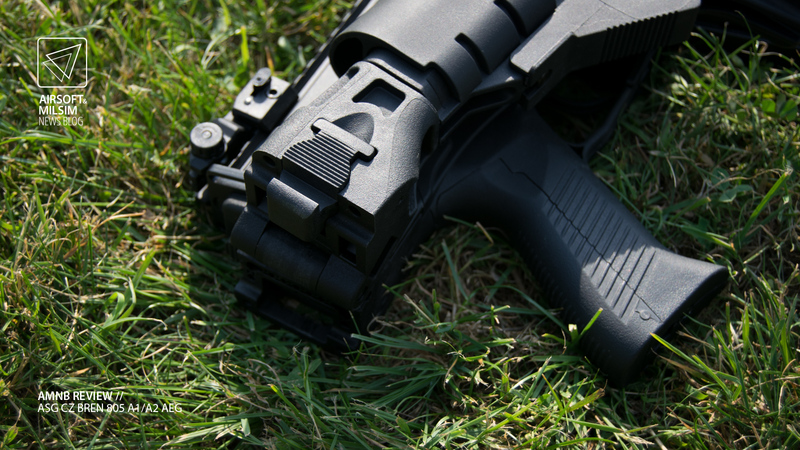 The trigger response is average due to the lack of a MOSFET unit and the long trigger pull of the rifle. 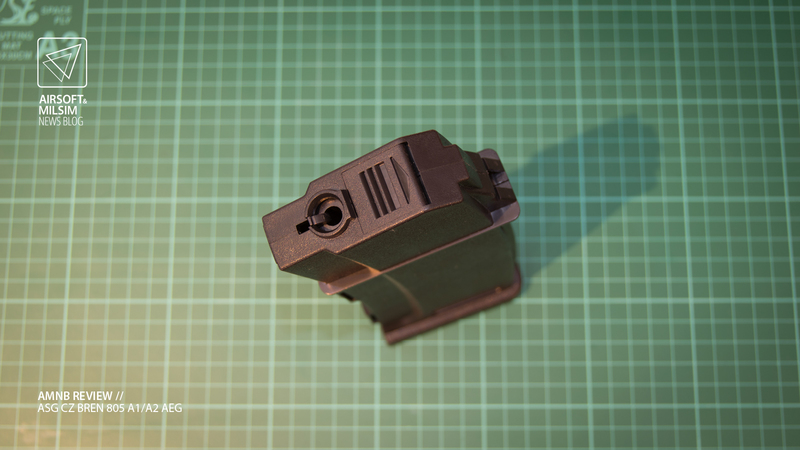 One nice benefit of the trigger is that you can feel the tipping point at which the trigger block gives way and cycles the gearbox. 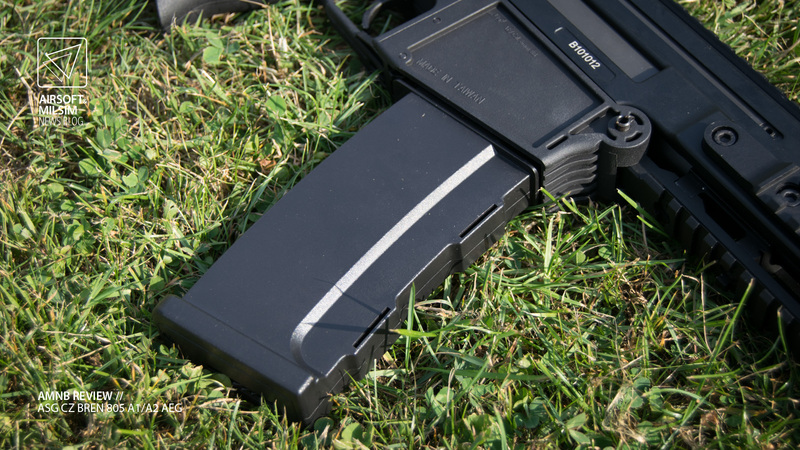 If you slowly release the trigger, you can also feel the block return. 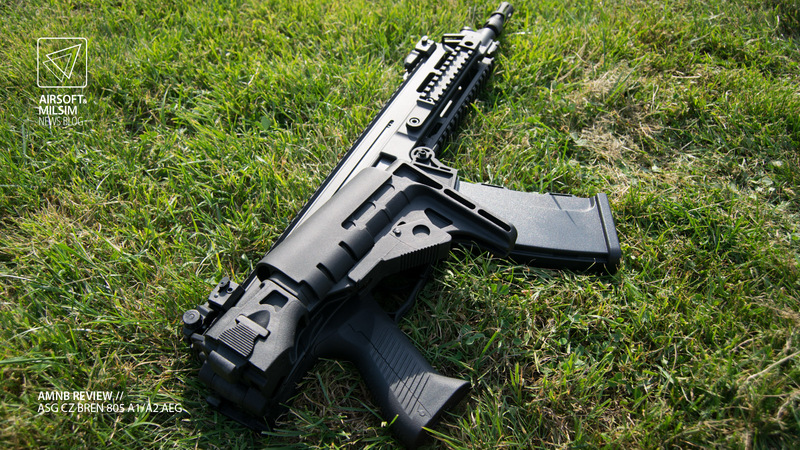 This AEG would have been brilliant with an ASCU unit much like the Scorpion EVO A3. 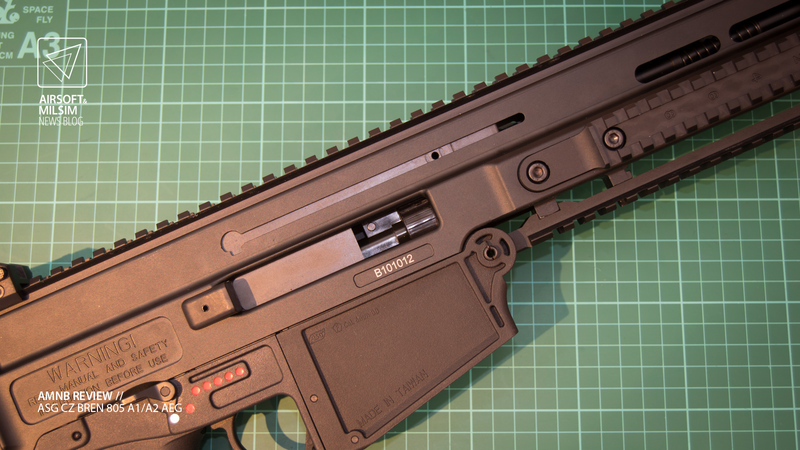 I have good news though, it is possible to install an ASCU unit with the ASHU (Airsoft Systems Hop Unit) and get the same response as the Scorpion EVO A3. 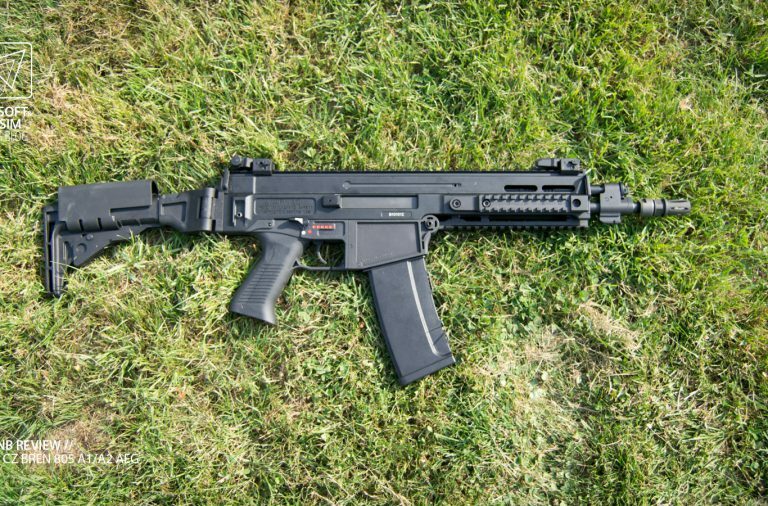 Having said this, I don’t know if I would go ahead and do this process until I am certain that the Bren won’t be re-released with the ASCU functions of the Scorpion EVO A3. 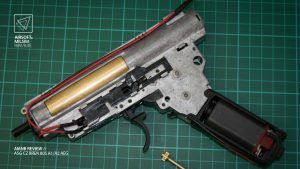 During the shooting test, it was very noticable that the motor sound and period taken from trigger pull till the bb was fired, took much longer than expected. 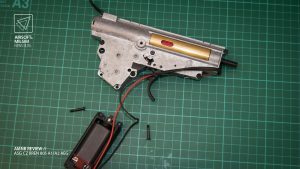 This was most probably because of the lack of MOSFET and/or me being used to gas operated replicas over electric operated replicas. The shooting of the Bren 805 was surprisingly smooth especially on full-auto (RPS is relative to the model but it is definitely a higher than average rate of fire than most AEGs), however the motor felt like it was trying to run away, ramp up its speed and didn’t stop as eagerly when the trigger was released. Once again, this could be fixed with a MOSFET being installed. 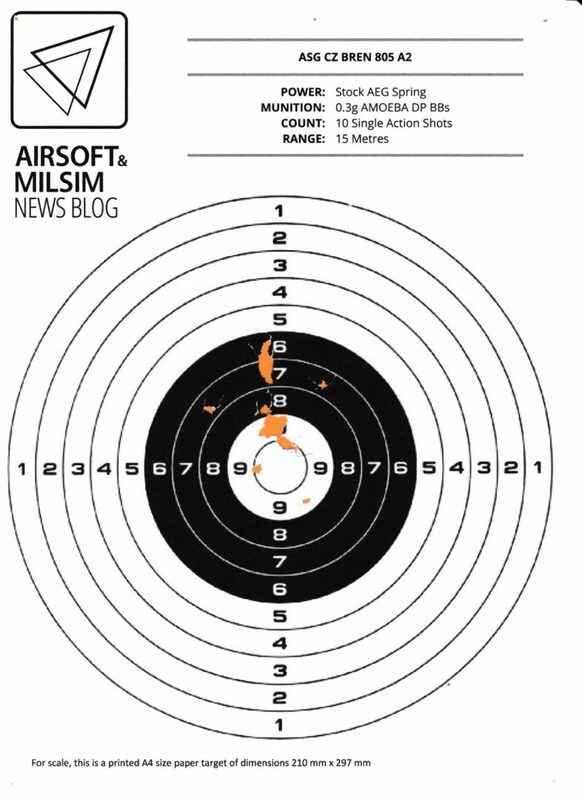 As can be seen with the shooting test, the range of the Bren 805 reaches 50 metres and possibly a bit further. The spread at close range seems to be very adequate, but as we got to 50 metres, the spread increased which shows the limitations so far of the range of this replica before any modification is made. 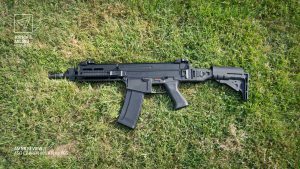 This is unfortunately not the most accurate AEG from ASG (the Scorpion EVO A3 is much more consistent even with the shorter barrel). 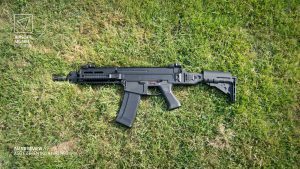 The ASG Bren 805 is quite reliable in a skirmish and seems to hold its own against knocks and scrapes against door frames, trees and concrete floors (yes I did accidentally drop it… on purpose). An issue did arise after a few games as the replica started to miss feed a few times. It became evident that the tolerance levels of the hop unit where the bbs are fed upwards can lead to dirt trapping the bbs to slow down and jam where the nozzle is moving too fast to let a bb load into the hop unit chamber. This is easily resolved by either cleaning the hop up unit (difficult, disassembly needed), or spraying a little silicone lubricant in a magazine of bbs and feeding it through the hop unit (easy, however will make the hop up of the bb malfunction until the silicone lubricant has rubbed off the hop up rubber after a few magazines are fired). 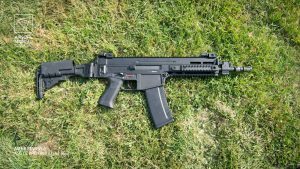 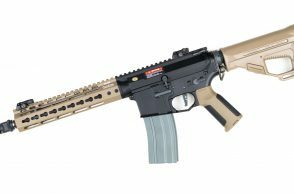 The ASG CZ Bren 805 A2 is a good AEG if you want an alternative to an M4 or AK variant of an Airsoft replica. Internally, the Bren 805 is typically like any other high quality AEG with no special features other than a quick change spring system. Externally, the ASG CZ Bren 805 is wonderful to look at and to handle. 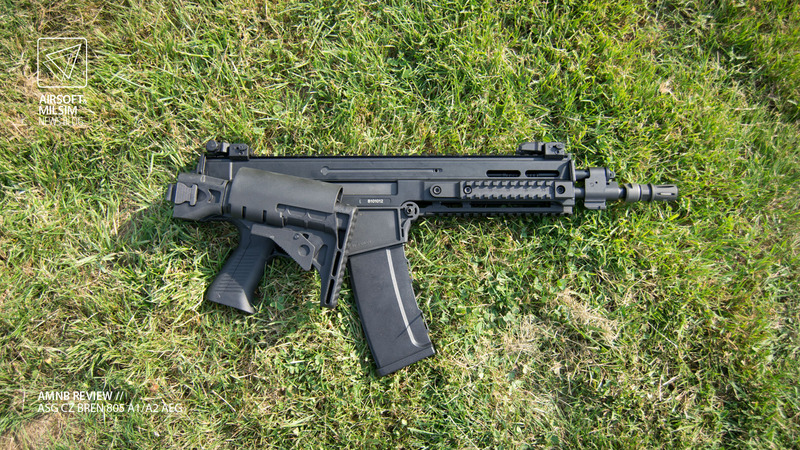 One could hope that ASG would get a GBBR version of the CZ Bren 805 out to make the realists drool. 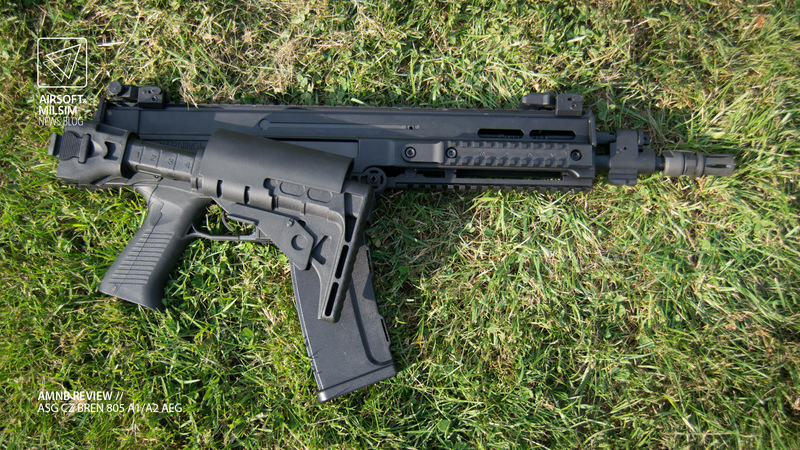 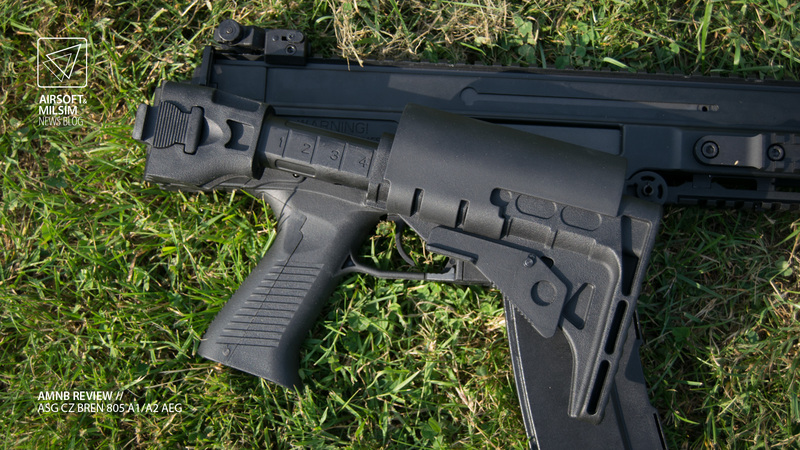 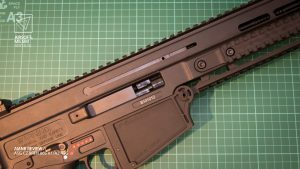 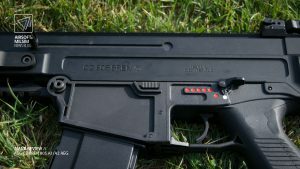 It would have been nice to have the ASCU features of the Scorpion EVO A3, however not having done so has benefits and issues depending on the user. If you want everything out of your AEG, you’re going to have to modify the Bren 805 until you fill that hole in your heart and feel content. 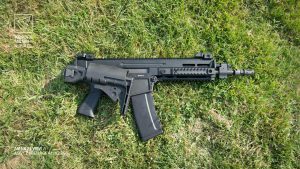 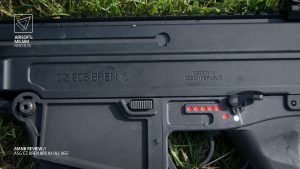 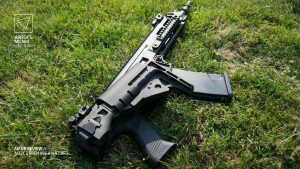 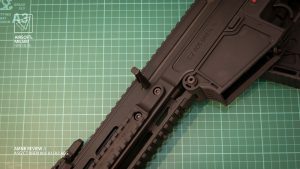 If you are used to budget guns and don’t mind not having all the features possible, this is definitely in the middle ground of budget AEG and high end with the added uniqueness of having the only Airsoft replica of the CZ Bren 805. 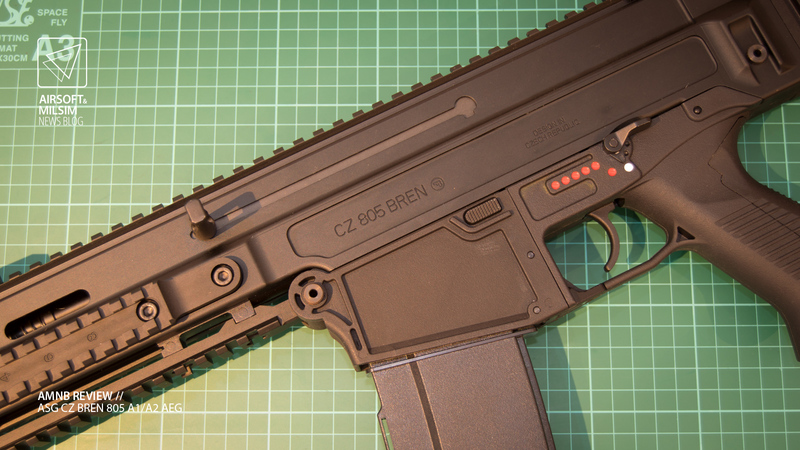 The adventure continues as the @actionsportgames CZ Bren 805 gets to go out in the night. 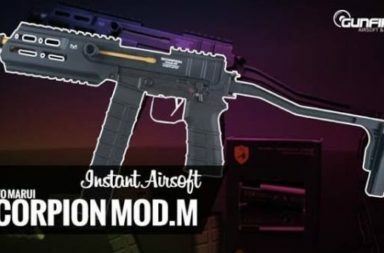 I have to say that Action Sports Games has done very well with the CZ Bren 805 and are definitely on a role with all things related to Ceska Zbrojovka. My personal opinion is that they should have carried on using the internals that are best known in the CZ Scorpion EVO A3. 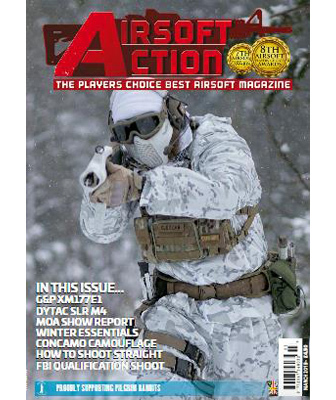 Having said this, I’m sure there is ample time for another version to be released in the future considering ASG are already delving into the world of High Powered Air operated replicas.